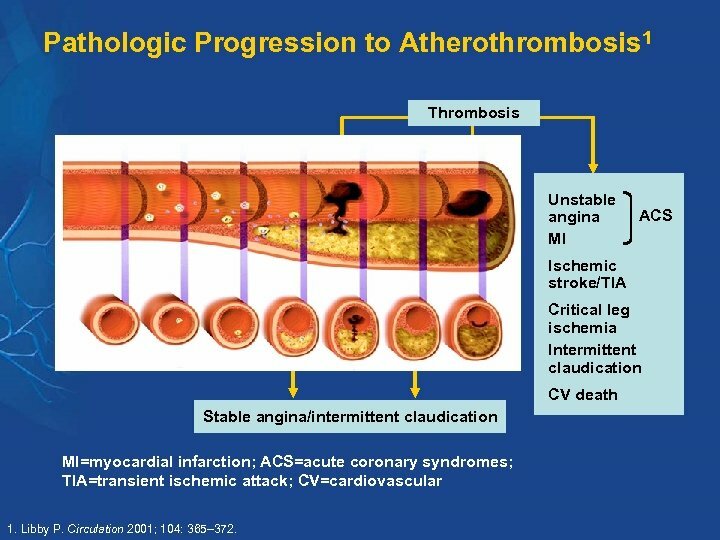 Pathologic Progression to Atherothrombosis 1 Thrombosis Unstable angina MI Atherosclerosis ACS Ischemic stroke/TIA Critical leg ischemia Intermittent claudication CV death Stable angina/intermittent claudication MI=myocardial infarction; ACS=acute coronary syndromes; TIA=transient ischemic attack; CV=cardiovascular 1. Libby P. Circulation 2001; 104: 365– 372. 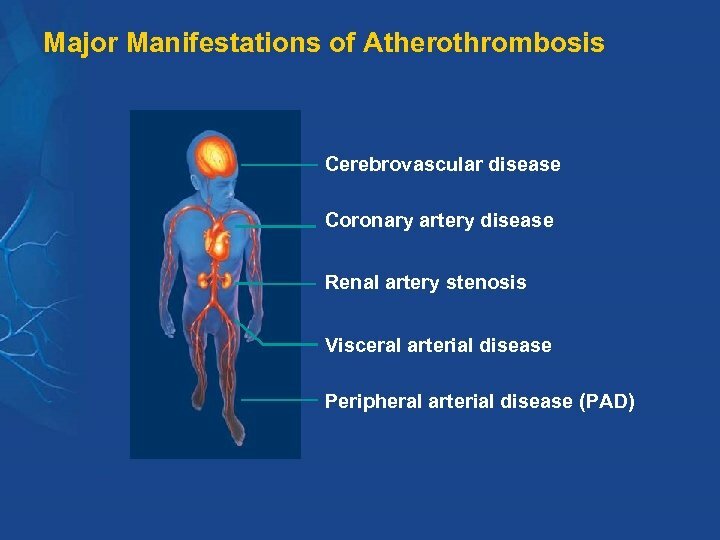 Prevalence of Atherothrombotic Manifestations is Increasing Worldwide*1 Prevalence 2000 2005 Populations aged >50 years 205. 0 million ( 5. 1% since 1997) 222. 2 million ( 13. 9% since 1997) MI 9. 1 million ( 12. 8% since 1997) 10. 7 million ( 32. 7% since 1997) Ischemic stroke 7. 1 million ( 11. 8% since 1997) 8. 4 million ( 31. 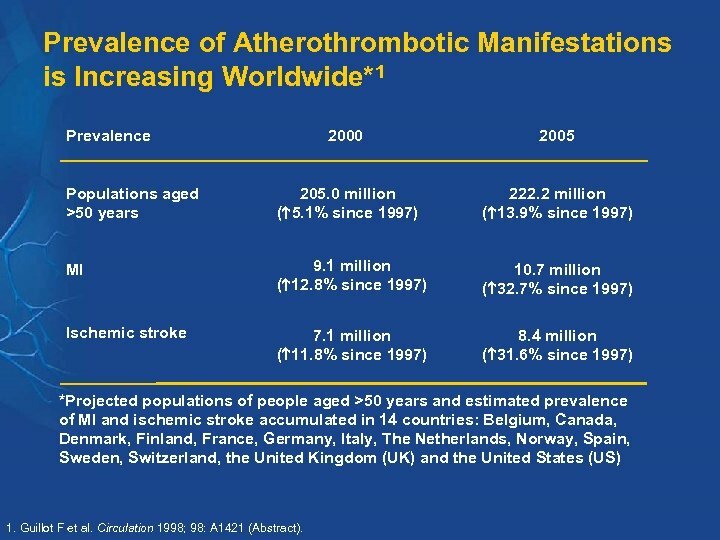 6% since 1997) *Projected populations of people aged >50 years and estimated prevalence of MI and ischemic stroke accumulated in 14 countries: Belgium, Canada, Denmark, Finland, France, Germany, Italy, The Netherlands, Norway, Spain, Sweden, Switzerland, the United Kingdom (UK) and the United States (US) 1. Guillot F et al. Circulation 1998; 98: A 1421 (Abstract). 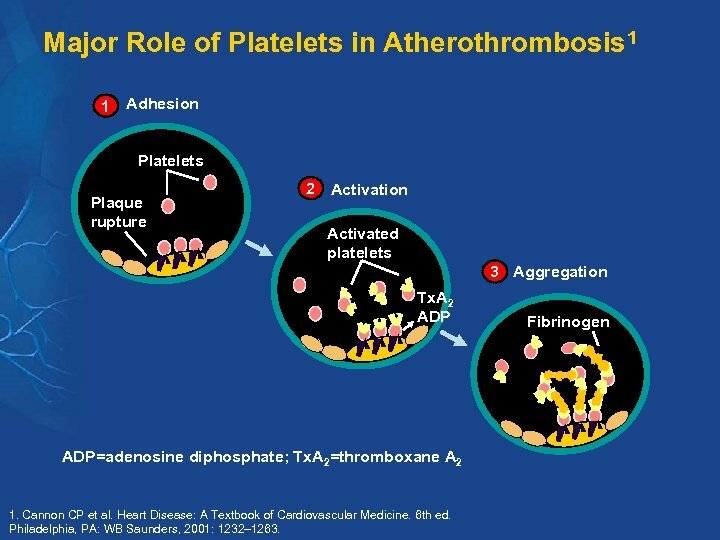 ACS is an Important Manifestation of Atherothrombosis 1 Plaque rupture Old term Stable angina UA New term Atherothrombosis Days– weeks Non. 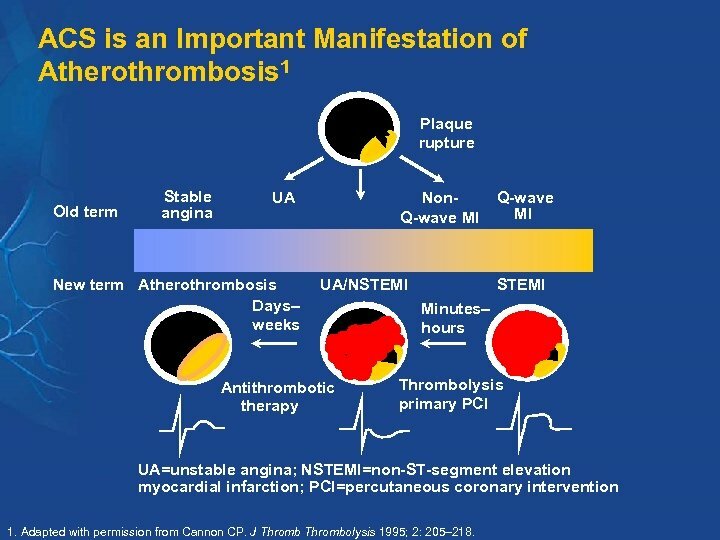 Q-wave MI UA/NSTEMI Antithrombotic therapy Q-wave MI STEMI Minutes– hours Thrombolysis primary PCI UA=unstable angina; NSTEMI=non-ST-segment elevation myocardial infarction; PCI=percutaneous coronary intervention 1. Adapted with permission from Cannon CP. J Thrombolysis 1995; 2: 205– 218. 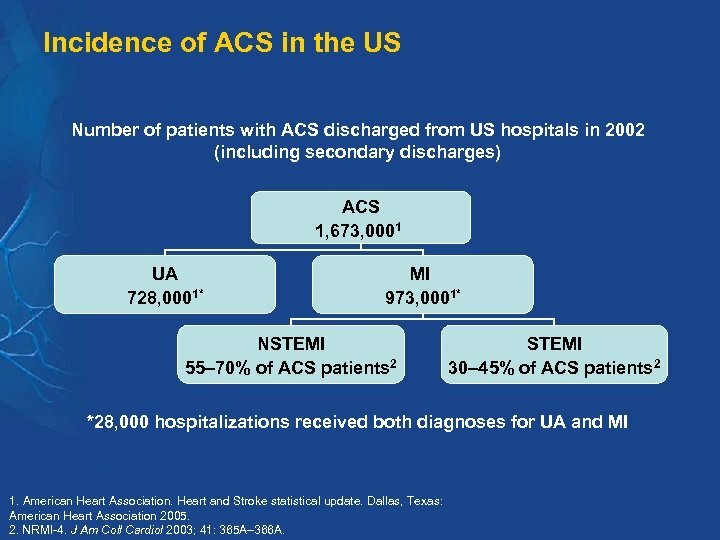 Incidence of ACS in the US Number of patients with ACS discharged from US hospitals in 2002 (including secondary discharges) ACS 1, 673, 0001 UA 728, 0001* MI 973, 0001* NSTEMI 55– 70% of ACS patients 2 STEMI 30– 45% of ACS patients 2 *28, 000 hospitalizations received both diagnoses for UA and MI 1. American Heart Association. Heart and Stroke statistical update. Dallas, Texas: American Heart Association 2005. 2. NRMI-4. 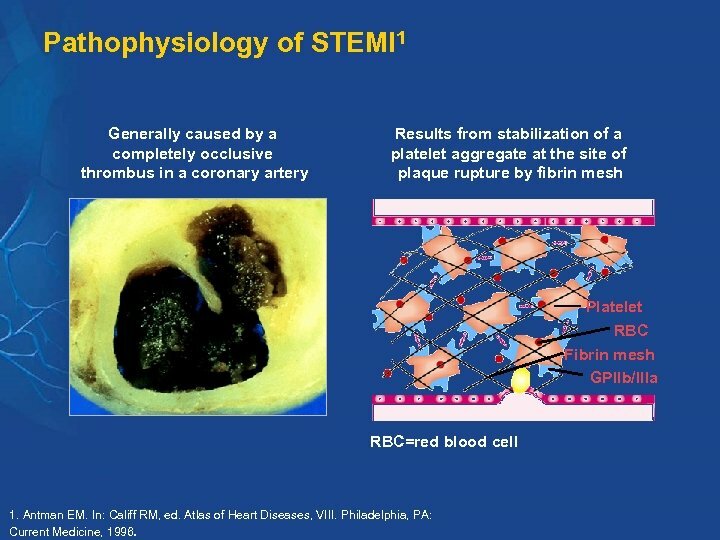 J Am Coll Cardiol 2003; 41: 365 A– 366 A.
Pathophysiology of STEMI 1 Generally caused by a completely occlusive thrombus in a coronary artery Results from stabilization of a platelet aggregate at the site of plaque rupture by fibrin mesh Platelet RBC Fibrin mesh GPIIb/IIIa RBC=red blood cell 1. Antman EM. In: Califf RM, ed. Atlas of Heart Diseases, VIII. Philadelphia, PA: Current Medicine, 1996. 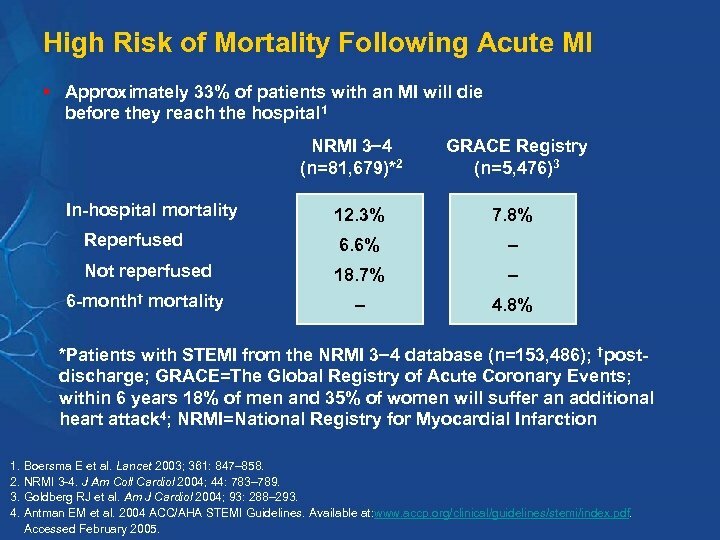 High Risk of Mortality Following Acute MI § Approximately 33% of patients with an MI will die before they reach the hospital 1 NRMI 3 4 (n=81, 679)*2 In-hospital mortality GRACE Registry (n=5, 476)3 12. 3% 7. 8% Reperfused 6. 6% – Not reperfused 18. 7% – 6 -month† mortality – 4. 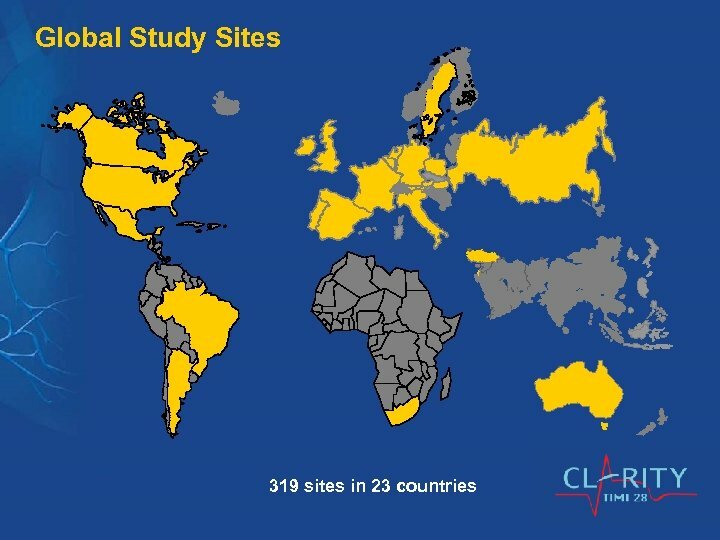 8% *Patients with STEMI from the NRMI 3 4 database (n=153, 486); †postdischarge; GRACE=The Global Registry of Acute Coronary Events; within 6 years 18% of men and 35% of women will suffer an additional heart attack 4; NRMI=National Registry for Myocardial Infarction 1. Boersma E et al. Lancet 2003; 361: 847– 858. 2. NRMI 3 -4. 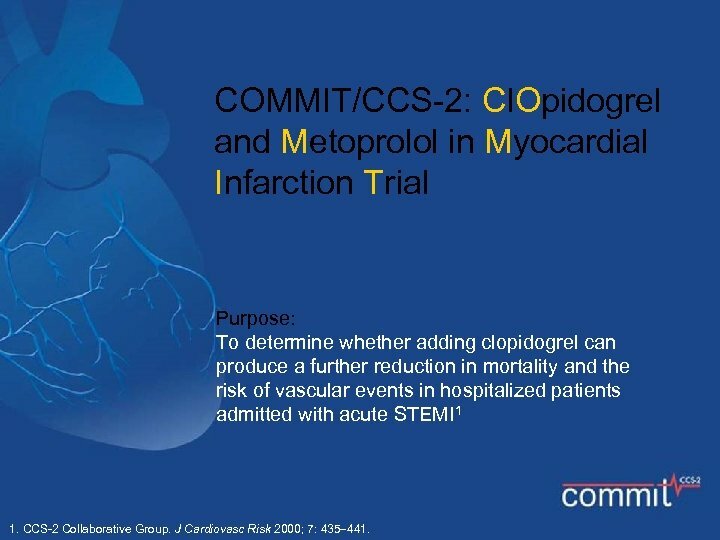 J Am Coll Cardiol 2004; 44: 783– 789. 3. Goldberg RJ et al. Am J Cardiol 2004; 93: 288– 293. 4. Antman EM et al. 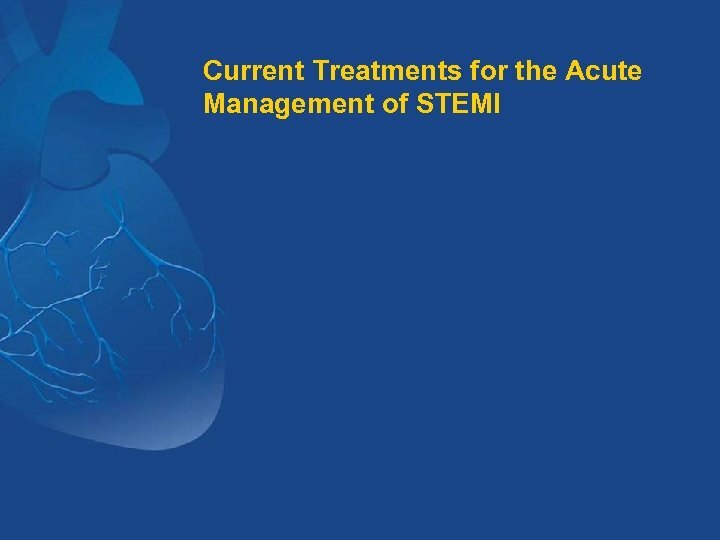 2004 ACC/AHA STEMI Guidelines. Available at: www. accp. 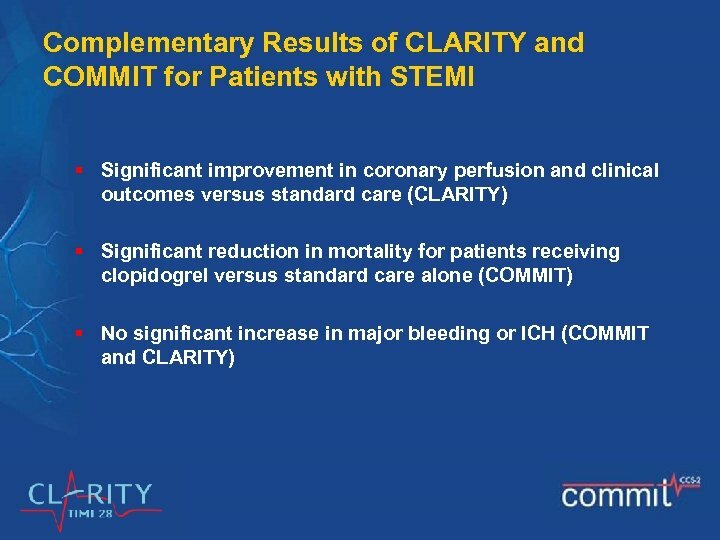 org/clinical/guidelines/stemi/index. pdf. Accessed February 2005. 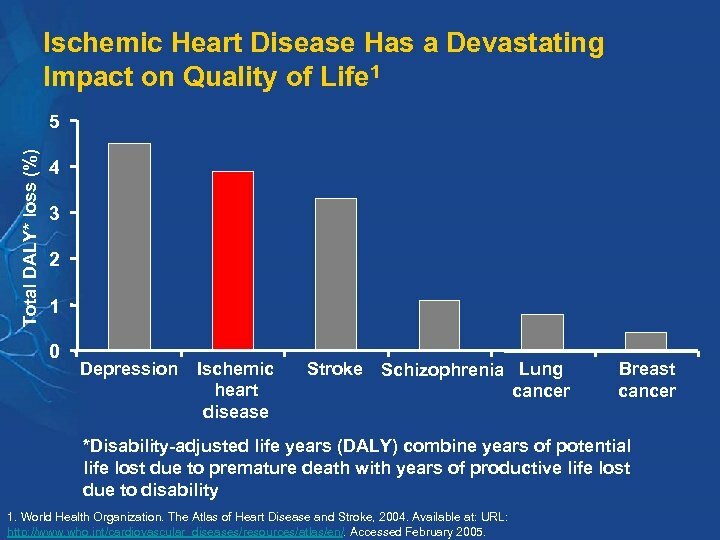 Ischemic Heart Disease Has a Devastating Impact on Quality of Life 1 Total DALY* loss (%) 5 4 3 2 1 0 Depression Ischemic heart disease Stroke Schizophrenia Lung cancer Breast cancer *Disability-adjusted life years (DALY) combine years of potential life lost due to premature death with years of productive life lost due to disability 1. World Health Organization. The Atlas of Heart Disease and Stroke, 2004. Available at: URL: http: //www. who. 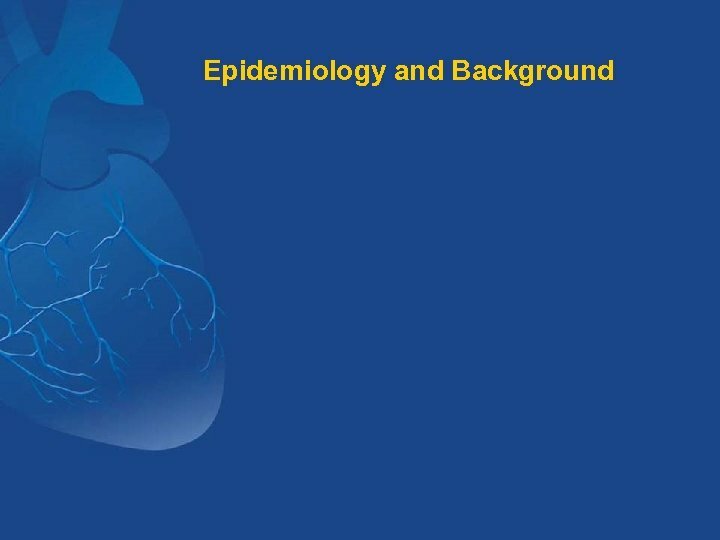 int/cardiovascular_diseases/resources/atlas/en/. Accessed February 2005. 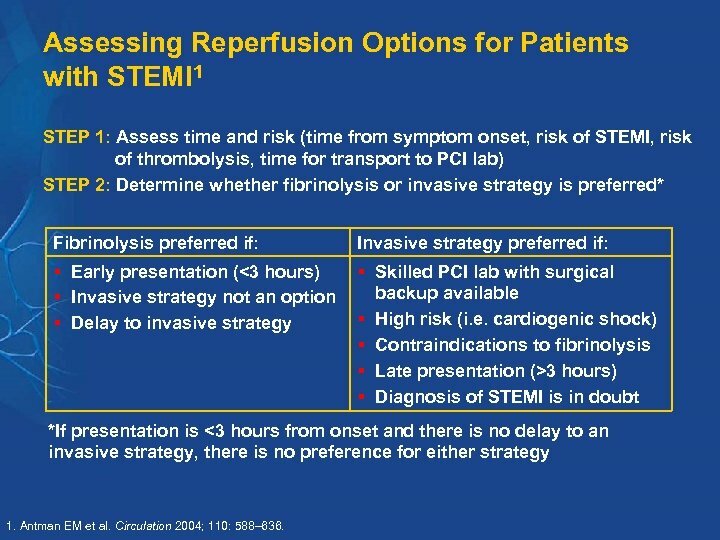 Assessing Reperfusion Options for Patients with STEMI 1 STEP 1: Assess time and risk (time from symptom onset, risk of STEMI, risk of thrombolysis, time for transport to PCI lab) STEP 2: Determine whether fibrinolysis or invasive strategy is preferred* Fibrinolysis preferred if: Invasive strategy preferred if: § Early presentation (<3 hours) § Invasive strategy not an option § Delay to invasive strategy § Skilled PCI lab with surgical backup available § High risk (i. e. cardiogenic shock) § Contraindications to fibrinolysis § Late presentation (>3 hours) § Diagnosis of STEMI is in doubt *If presentation is <3 hours from onset and there is no delay to an invasive strategy, there is no preference for either strategy 1. Antman EM et al. Circulation 2004; 110: 588– 636. 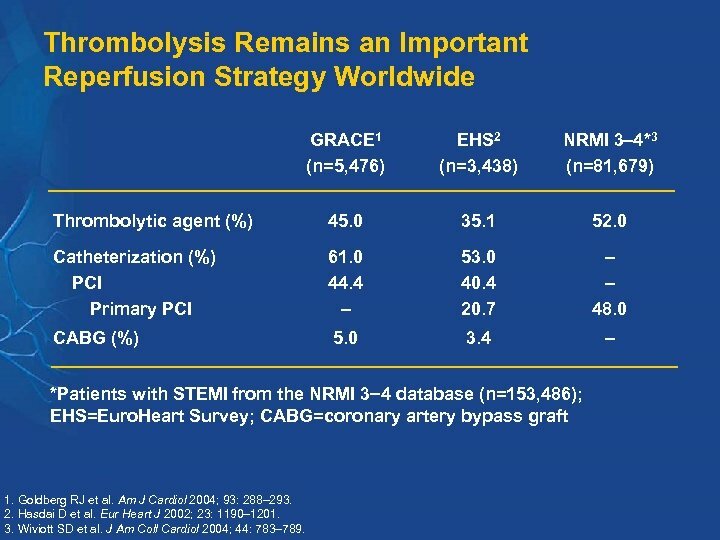 Thrombolysis Remains an Important Reperfusion Strategy Worldwide GRACE 1 (n=5, 476) EHS 2 (n=3, 438) NRMI 3 4*3 (n=81, 679) Thrombolytic agent (%) 45. 0 35. 1 52. 0 Catheterization (%) PCI Primary PCI 61. 0 44. 4 – 53. 0 40. 4 20. 7 – – 48. 0 CABG (%) 5. 0 3. 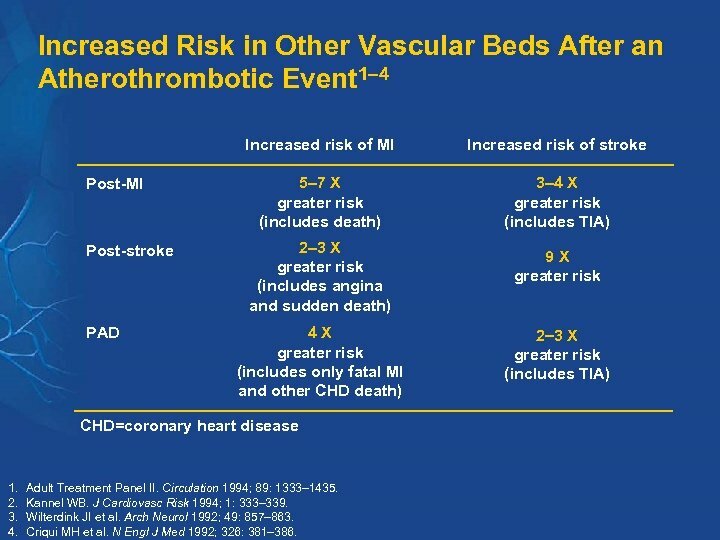 4 – *Patients with STEMI from the NRMI 3 4 database (n=153, 486); EHS=Euro. Heart Survey; CABG=coronary artery bypass graft 1. Goldberg RJ et al. Am J Cardiol 2004; 93: 288– 293. 2. Hasdai D et al. Eur Heart J 2002; 23: 1190– 1201. 3. Wiviott SD et al. J Am Coll Cardiol 2004; 44: 783– 789. 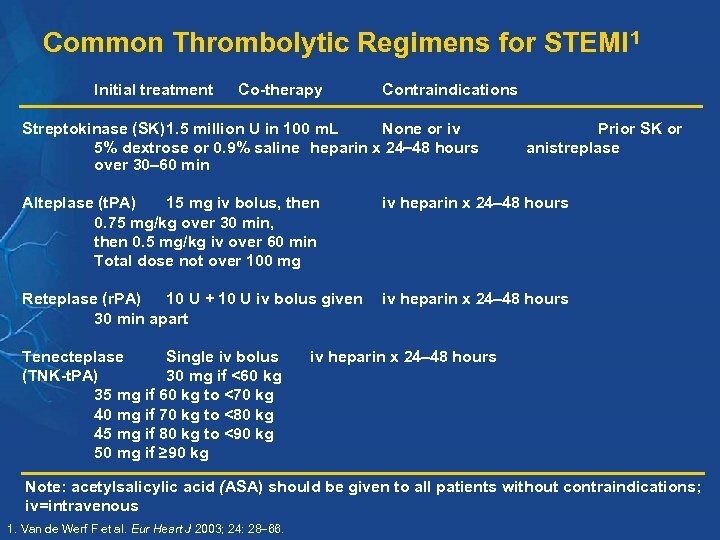 Common Thrombolytic Regimens for STEMI 1 Initial treatment Co-therapy Contraindications Streptokinase (SK)1. 5 million U in 100 m. L None or iv 5% dextrose or 0. 9% saline heparin x 24 48 hours over 30 60 min Prior SK or anistreplase Alteplase (t. PA) 15 mg iv bolus, then 0. 75 mg/kg over 30 min, then 0. 5 mg/kg iv over 60 min Total dose not over 100 mg iv heparin x 24 48 hours Reteplase (r. PA) 10 U + 10 U iv bolus given 30 min apart iv heparin x 24 48 hours Tenecteplase Single iv bolus (TNK-t. PA) 30 mg if <60 kg 35 mg if 60 kg to <70 kg 40 mg if 70 kg to <80 kg 45 mg if 80 kg to <90 kg 50 mg if ≥ 90 kg iv heparin x 24 48 hours Note: acetylsalicylic acid (ASA) should be given to all patients without contraindications; iv=intravenous 1. Van de Werf F et al. Eur Heart J 2003; 24: 28 66. 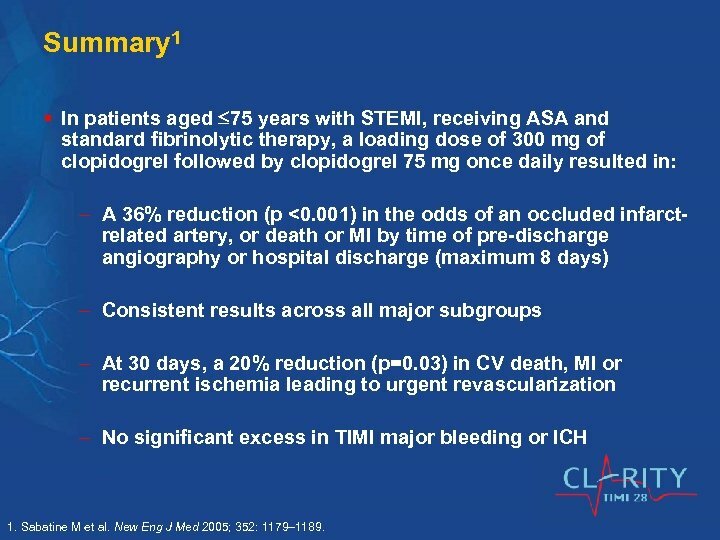 Thrombolysis and ASA in Acute STEMI: ISIS-21 25%* p <0. 00001 23%* p <0. 00001 14 5 -week mortality (%) 12 10 42%* p <0. 00001 13. 2% 12. 0% 11. 8% 9. 2% 9. 4% 8. 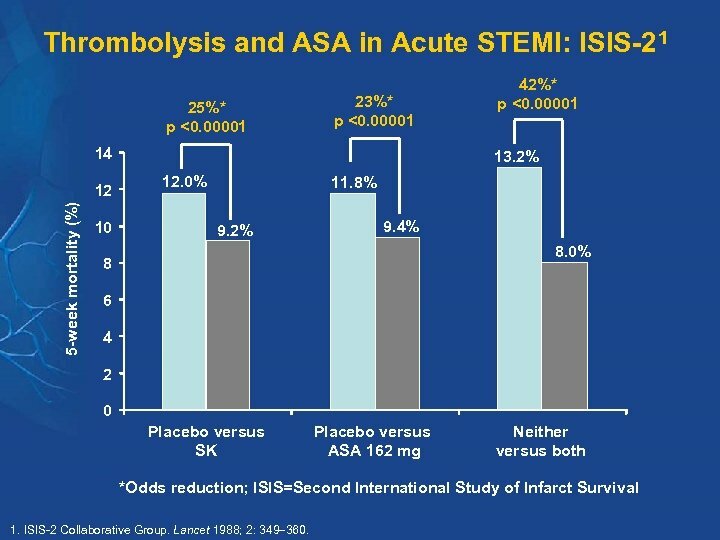 0% 8 6 4 2 0 Placebo versus SK Placebo versus ASA 162 mg Neither versus both *Odds reduction; ISIS=Second International Study of Infarct Survival 1. ISIS-2 Collaborative Group. Lancet 1988; 2: 349 360. 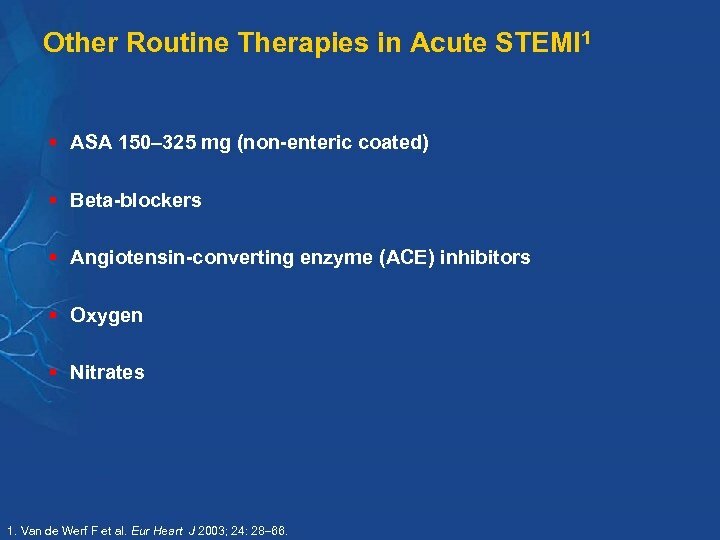 Other Routine Therapies in Acute STEMI 1 § ASA 150 325 mg (non-enteric coated) § Beta-blockers § Angiotensin-converting enzyme (ACE) inhibitors § Oxygen § Nitrates 1. Van de Werf F et al. Eur Heart J 2003; 24: 28 66. 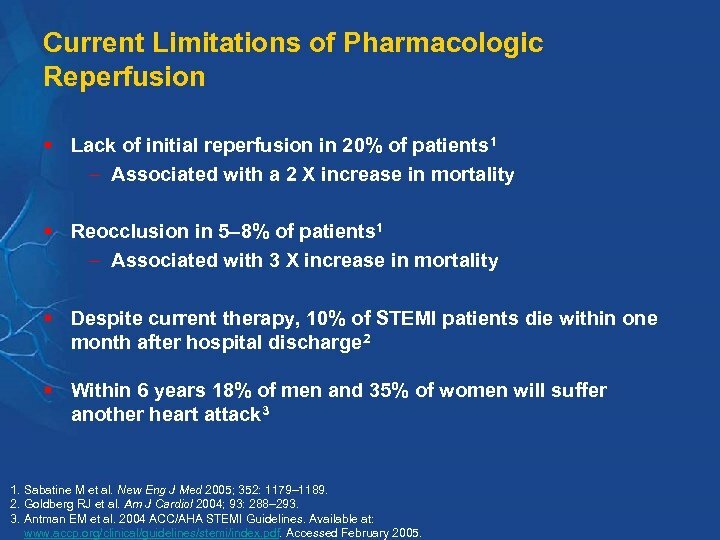 Current Limitations of Pharmacologic Reperfusion § Lack of initial reperfusion in 20% of patients 1 – Associated with a 2 X increase in mortality § Reocclusion in 5– 8% of patients 1 – Associated with 3 X increase in mortality § Despite current therapy, 10% of STEMI patients die within one month after hospital discharge 2 § Within 6 years 18% of men and 35% of women will suffer another heart attack 3 1. Sabatine M et al. New Eng J Med 2005; 352: 1179– 1189. 2. Goldberg RJ et al. Am J Cardiol 2004; 93: 288– 293. 3. Antman EM et al. 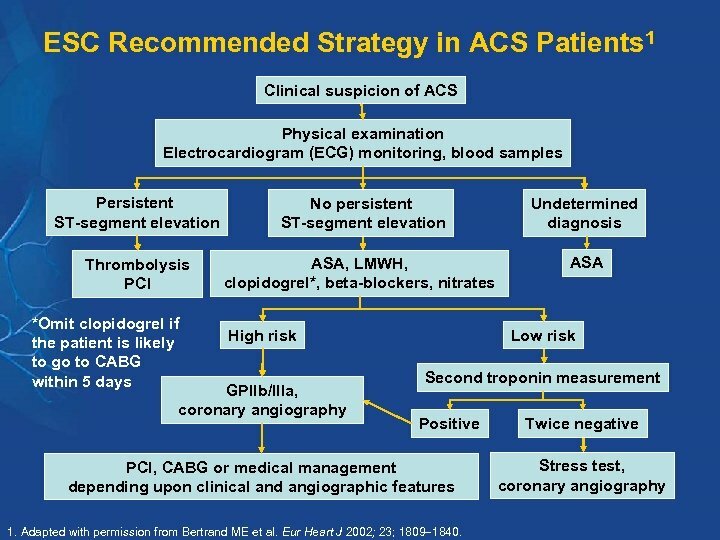 2004 ACC/AHA STEMI Guidelines. Available at: www. accp. 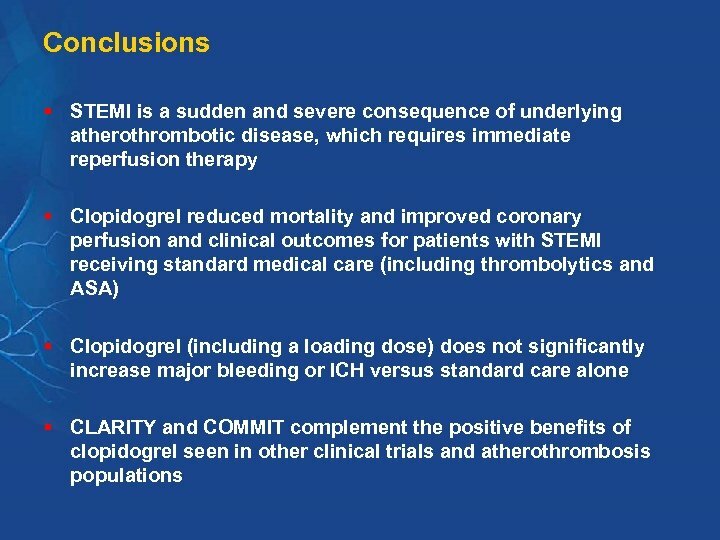 org/clinical/guidelines/stemi/index. pdf. Accessed February 2005. 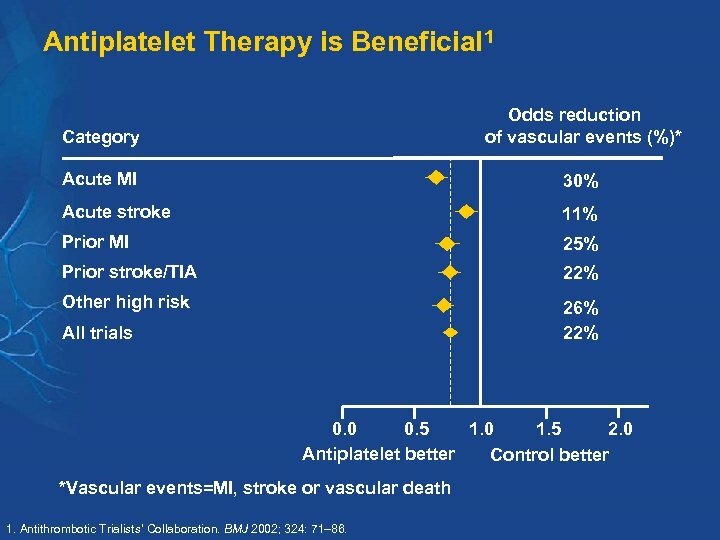 Antiplatelet Therapy is Beneficial 1 Category Odds reduction of vascular events (%)* Acute MI 30% Acute stroke 11% Prior MI 25% Prior stroke/TIA 22% Other high risk 26% 22% All trials 0. 0 0. 5 1. 0 1. 5 2. 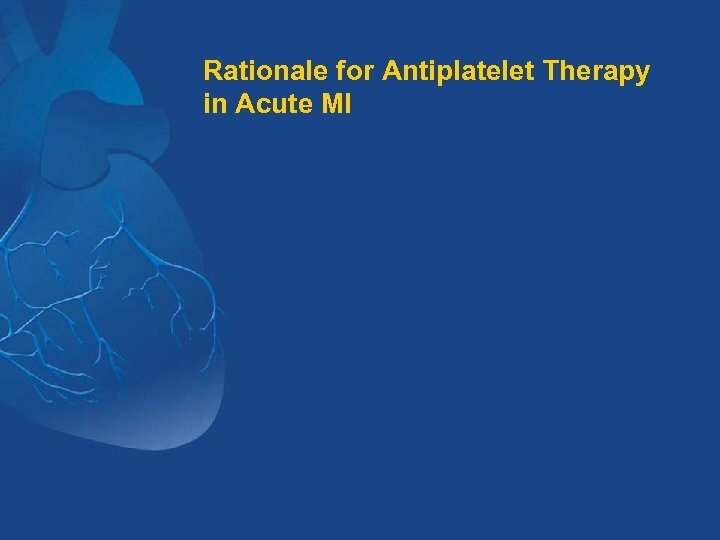 0 Antiplatelet better Control better *Vascular events=MI, stroke or vascular death 1. Antithrombotic Trialists’ Collaboration. BMJ 2002; 324: 71– 86. 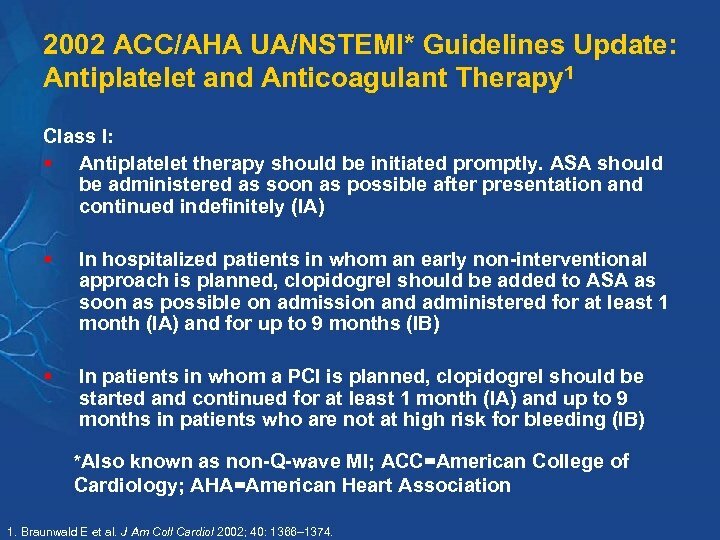 2002 ACC/AHA UA/NSTEMI* Guidelines Update: Antiplatelet and Anticoagulant Therapy 1 Class I: § Antiplatelet therapy should be initiated promptly. 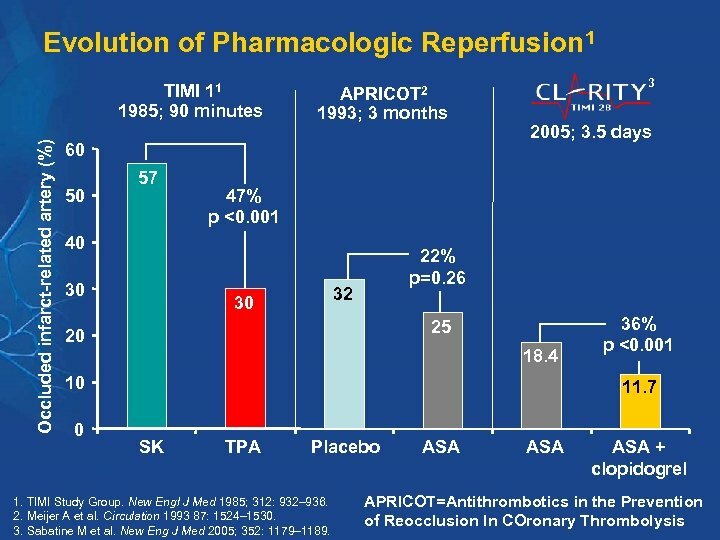 ASA should be administered as soon as possible after presentation and continued indefinitely (IA) § In hospitalized patients in whom an early non-interventional approach is planned, clopidogrel should be added to ASA as soon as possible on admission and administered for at least 1 month (IA) and for up to 9 months (IB) § In patients in whom a PCI is planned, clopidogrel should be started and continued for at least 1 month (IA) and up to 9 months in patients who are not at high risk for bleeding (IB) *Also known as non-Q-wave MI; ACC=American College of Cardiology; AHA=American Heart Association 1. Braunwald E et al. J Am Coll Cardiol 2002; 40: 1366– 1374. 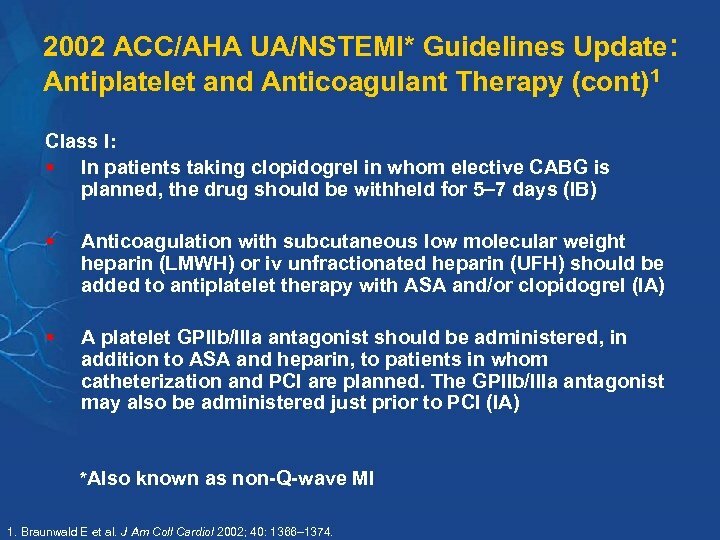 2002 ACC/AHA UA/NSTEMI* Guidelines Update: Antiplatelet and Anticoagulant Therapy (cont)1 Class I: § In patients taking clopidogrel in whom elective CABG is planned, the drug should be withheld for 5 7 days (IB) § Anticoagulation with subcutaneous low molecular weight heparin (LMWH) or iv unfractionated heparin (UFH) should be added to antiplatelet therapy with ASA and/or clopidogrel (IA) § A platelet GPIIb/IIIa antagonist should be administered, in addition to ASA and heparin, to patients in whom catheterization and PCI are planned. The GPIIb/IIIa antagonist may also be administered just prior to PCI (IA) *Also known as non-Q-wave MI 1. Braunwald E et al. J Am Coll Cardiol 2002; 40: 1366– 1374. 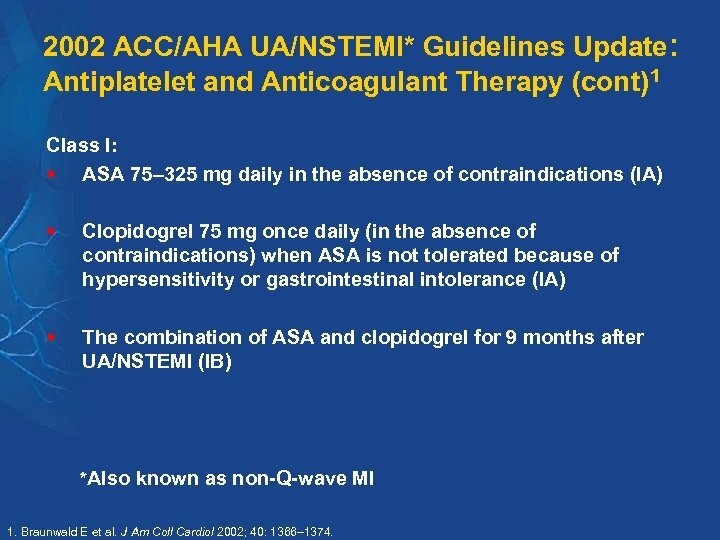 2002 ACC/AHA UA/NSTEMI* Guidelines Update: Antiplatelet and Anticoagulant Therapy (cont)1 Class I: § ASA 75– 325 mg daily in the absence of contraindications (IA) § Clopidogrel 75 mg once daily (in the absence of contraindications) when ASA is not tolerated because of hypersensitivity or gastrointestinal intolerance (IA) § The combination of ASA and clopidogrel for 9 months after UA/NSTEMI (IB) *Also known as non-Q-wave MI 1. Braunwald E et al. J Am Coll Cardiol 2002; 40: 1366– 1374. 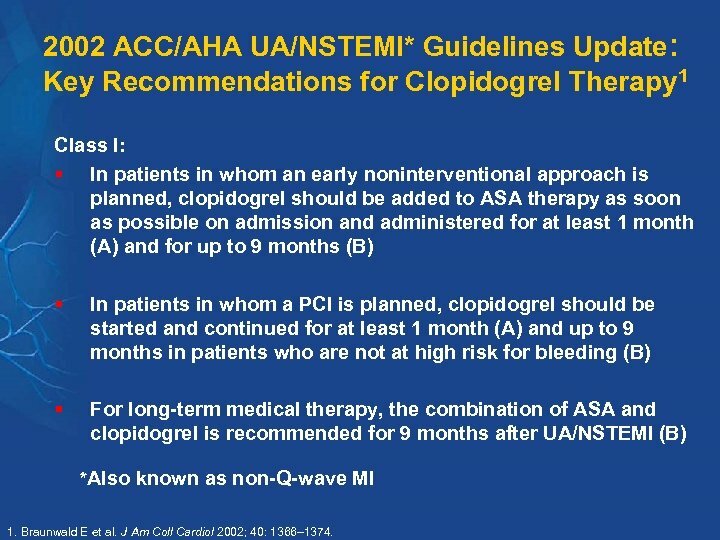 2002 ACC/AHA UA/NSTEMI* Guidelines Update: Key Recommendations for Clopidogrel Therapy 1 Class I: § In patients in whom an early noninterventional approach is planned, clopidogrel should be added to ASA therapy as soon as possible on admission and administered for at least 1 month (A) and for up to 9 months (B) § In patients in whom a PCI is planned, clopidogrel should be started and continued for at least 1 month (A) and up to 9 months in patients who are not at high risk for bleeding (B) § For long-term medical therapy, the combination of ASA and clopidogrel is recommended for 9 months after UA/NSTEMI (B) *Also known as non-Q-wave MI 1. Braunwald E et al. J Am Coll Cardiol 2002; 40: 1366– 1374. 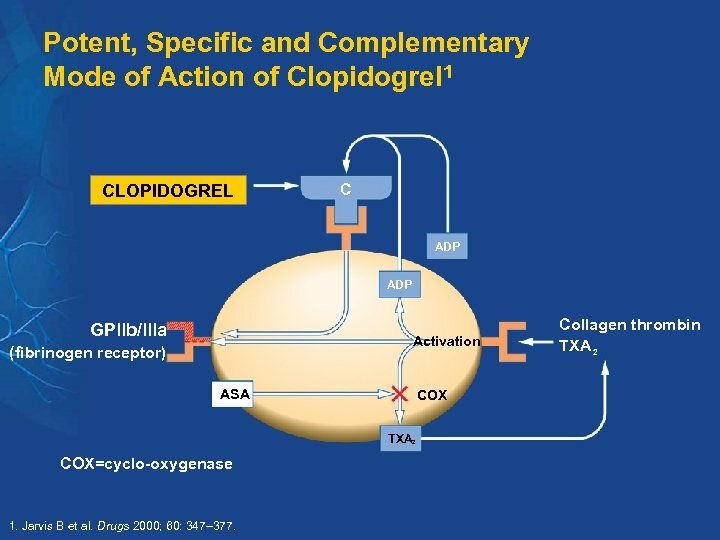 CLopidogrel as Adjunctive Reperfus. Ion Therap. 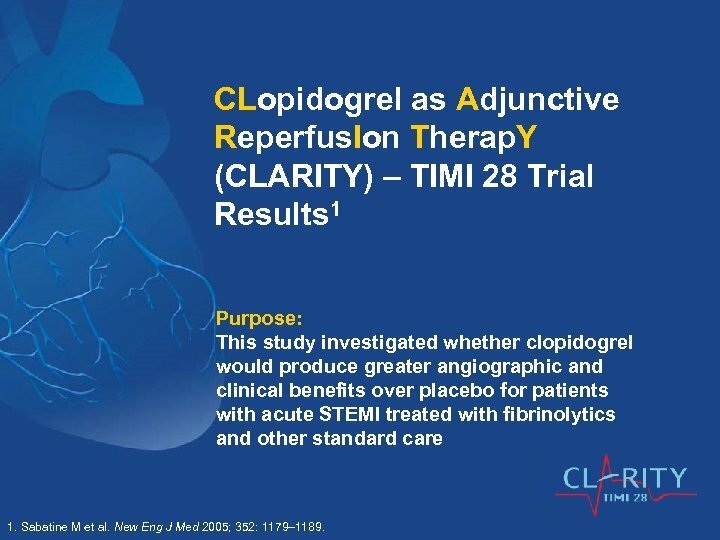 Y (CLARITY) – TIMI 28 Trial Results 1 Purpose: This study investigated whether clopidogrel would produce greater angiographic and clinical benefits over placebo for patients with acute STEMI treated with fibrinolytics and other standard care 1. Sabatine M et al. New Eng J Med 2005; 352: 1179– 1189. 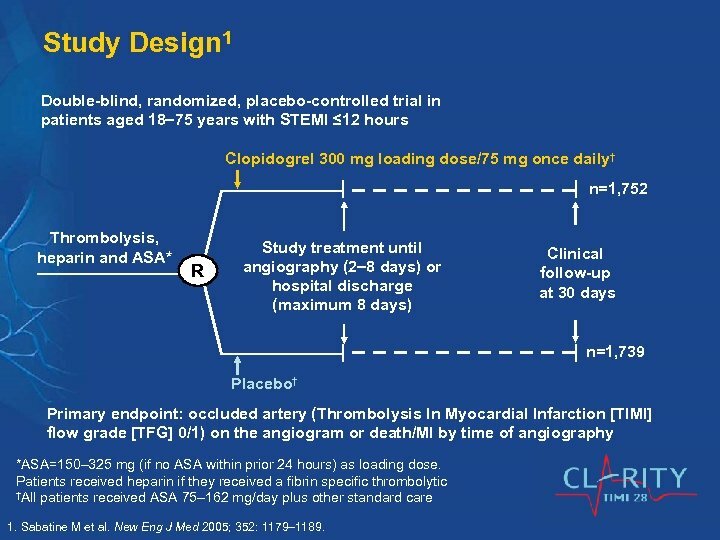 Study Design 1 Double-blind, randomized, placebo-controlled trial in patients aged 18 75 years with STEMI ≤ 12 hours Clopidogrel 300 mg loading dose/75 mg once daily† n=1, 752 Thrombolysis, heparin and ASA* R Study treatment until angiography (2 8 days) or hospital discharge (maximum 8 days) Clinical follow-up at 30 days n=1, 739 Placebo† Primary endpoint: occluded artery (Thrombolysis In Myocardial Infarction [TIMI] flow grade [TFG] 0/1) on the angiogram or death/MI by time of angiography *ASA=150– 325 mg (if no ASA within prior 24 hours) as loading dose. Patients received heparin if they received a fibrin specific thrombolytic †All patients received ASA 75– 162 mg/day plus other standard care 1. Sabatine M et al. New Eng J Med 2005; 352: 1179– 1189. 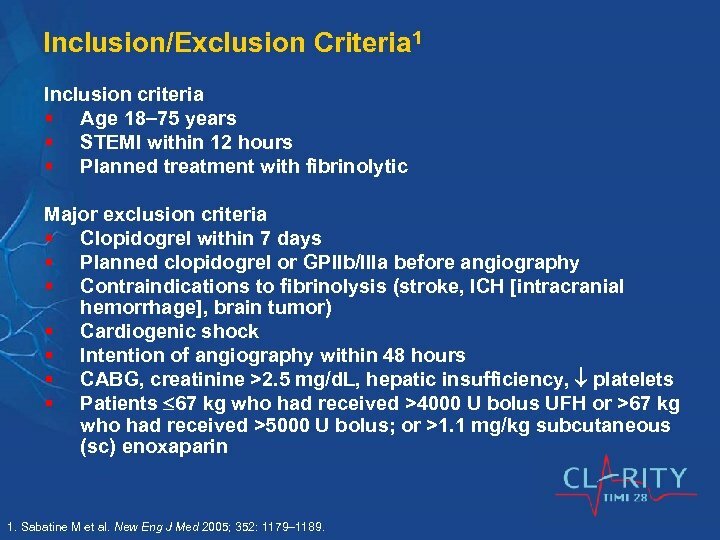 Inclusion/Exclusion Criteria 1 Inclusion criteria § Age 18 75 years § STEMI within 12 hours § Planned treatment with fibrinolytic Major exclusion criteria § Clopidogrel within 7 days § Planned clopidogrel or GPIIb/IIIa before angiography § Contraindications to fibrinolysis (stroke, ICH [intracranial hemorrhage], brain tumor) § Cardiogenic shock § Intention of angiography within 48 hours § CABG, creatinine >2. 5 mg/d. L, hepatic insufficiency, platelets § Patients 67 kg who had received >4000 U bolus UFH or >67 kg who had received >5000 U bolus; or >1. 1 mg/kg subcutaneous (sc) enoxaparin 1. Sabatine M et al. New Eng J Med 2005; 352: 1179– 1189. 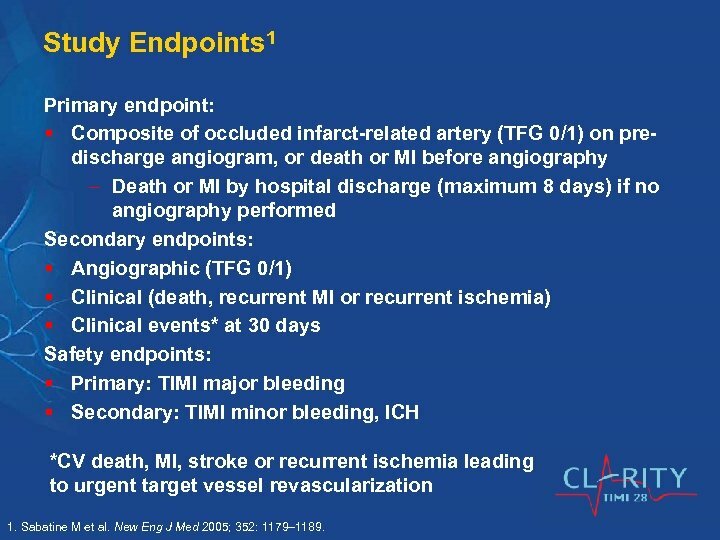 Study Endpoints 1 Primary endpoint: § Composite of occluded infarct-related artery (TFG 0/1) on predischarge angiogram, or death or MI before angiography Death or MI by hospital discharge (maximum 8 days) if no angiography performed Secondary endpoints: § Angiographic (TFG 0/1) § Clinical (death, recurrent MI or recurrent ischemia) § Clinical events* at 30 days Safety endpoints: § Primary: TIMI major bleeding § Secondary: TIMI minor bleeding, ICH *CV death, MI, stroke or recurrent ischemia leading to urgent target vessel revascularization 1. Sabatine M et al. New Eng J Med 2005; 352: 1179– 1189. 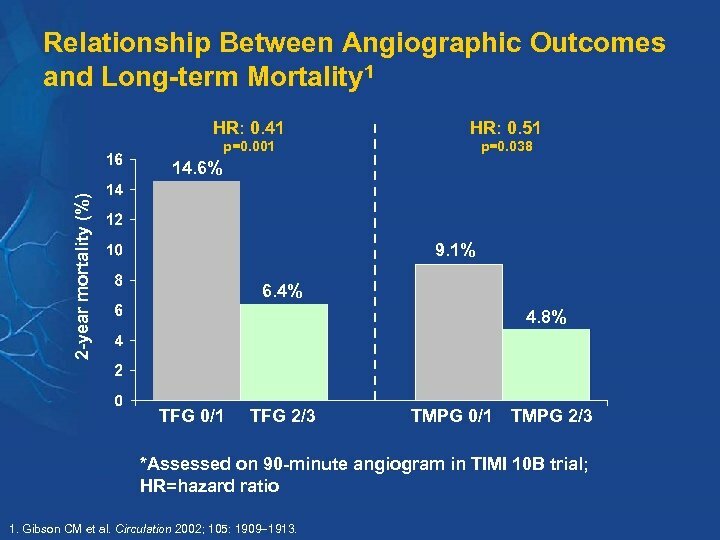 Relationship Between Angiographic Outcomes and Long-term Mortality 1 HR: 0. 41 HR: 0. 51 p=0. 001 p=0. 038 2 -year mortality (%) 14. 6% 9. 1% 6. 4% 4. 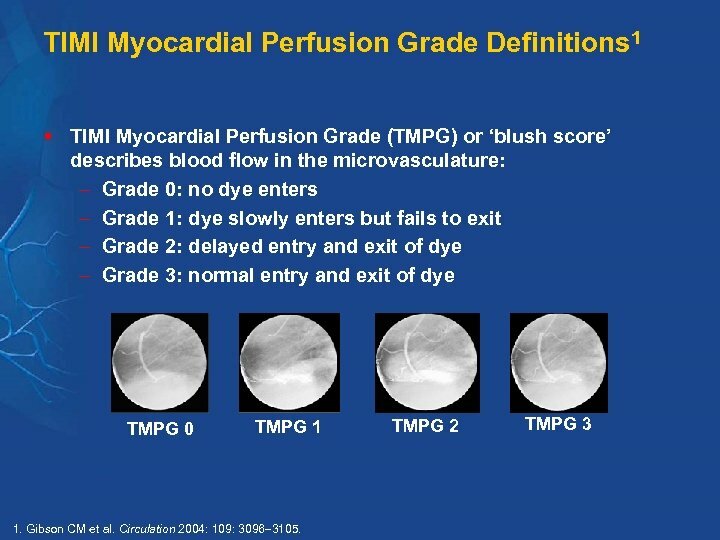 8% TFG 0/1 TFG 2/3 TMPG 0/1 TMPG 2/3 *Assessed on 90 -minute angiogram in TIMI 10 B trial; HR=hazard ratio 1. Gibson CM et al. Circulation 2002; 105: 1909 1913. 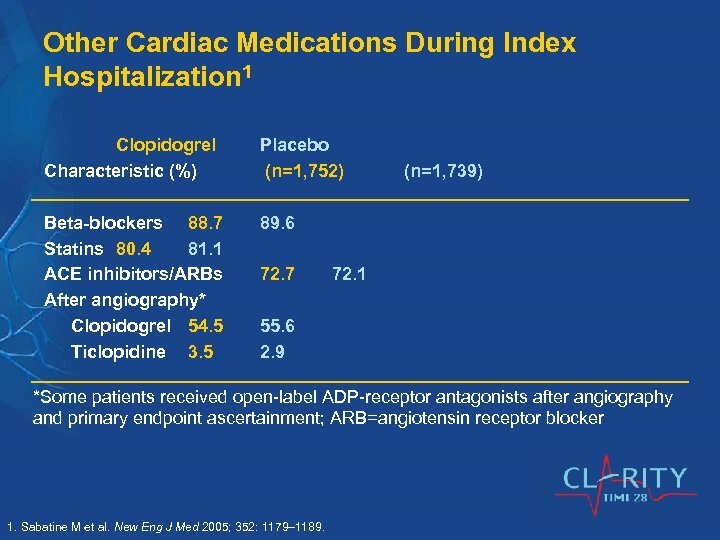 Other Cardiac Medications During Index Hospitalization 1 Clopidogrel Characteristic (%) Placebo (n=1, 752) Beta-blockers 88. 7 Statins 80. 4 81. 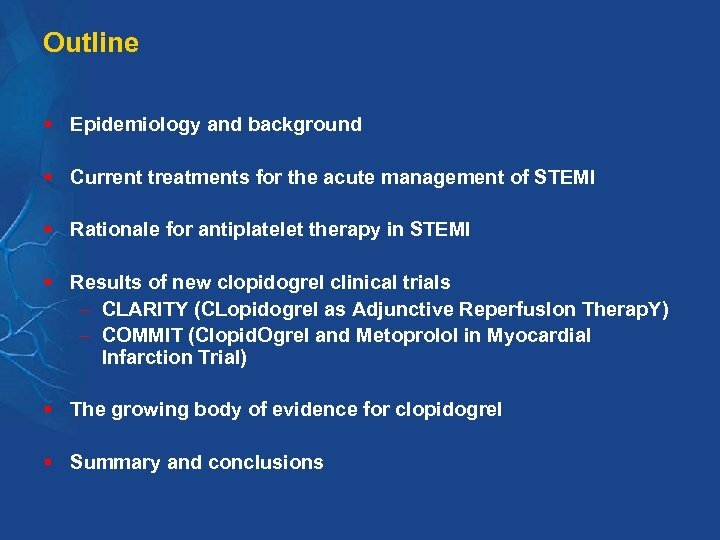 1 ACE inhibitors/ARBs After angiography* Clopidogrel 54. 5 Ticlopidine 3. 5 89. 6 72. 7 (n=1, 739) 72. 1 55. 6 2. 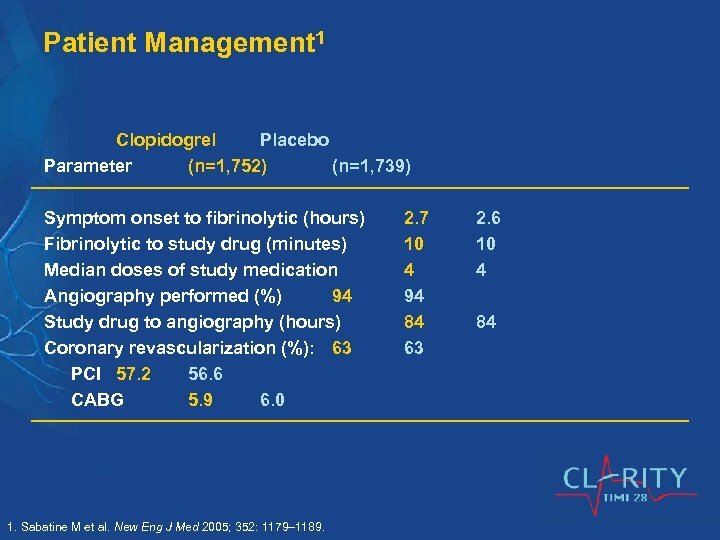 9 *Some patients received open-label ADP-receptor antagonists after angiography and primary endpoint ascertainment; ARB=angiotensin receptor blocker 1. Sabatine M et al. New Eng J Med 2005; 352: 1179– 1189. 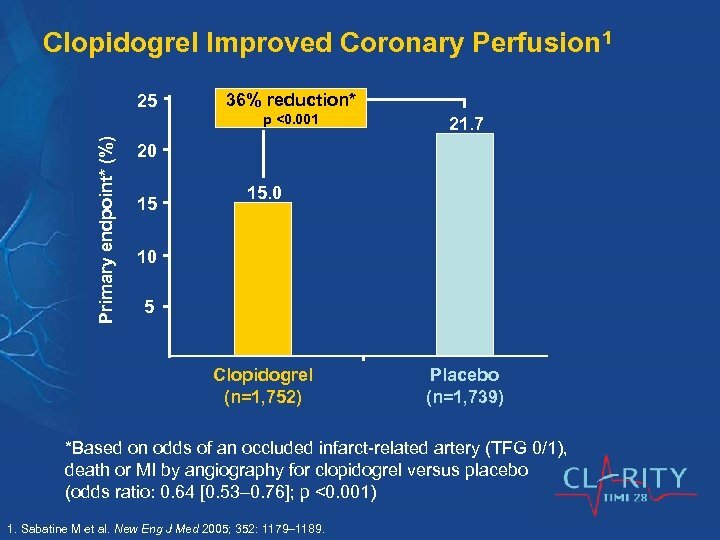 Clopidogrel Improved Coronary Perfusion 1 25 36% reduction* Primary endpoint* (%) p <0. 001 21. 7 20 15 15. 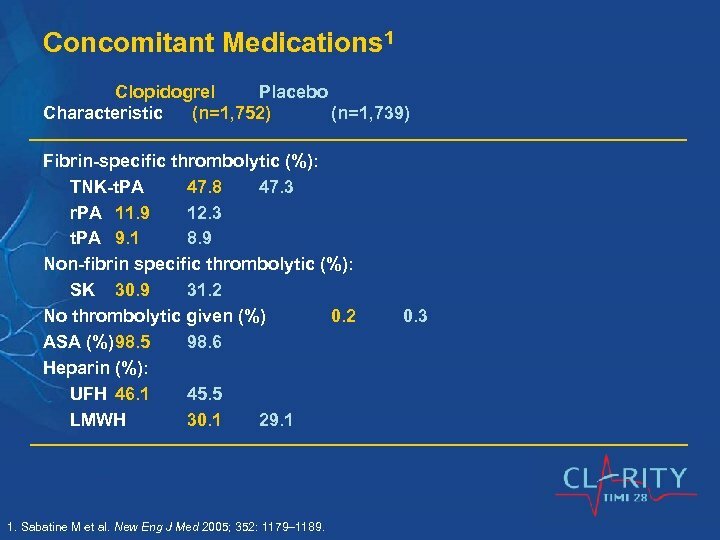 0 10 5 Clopidogrel (n=1, 752) Placebo (n=1, 739) *Based on odds of an occluded infarct-related artery (TFG 0/1), death or MI by angiography for clopidogrel versus placebo (odds ratio: 0. 64 [0. 53 0. 76]; p <0. 001) 1. Sabatine M et al. New Eng J Med 2005; 352: 1179– 1189. 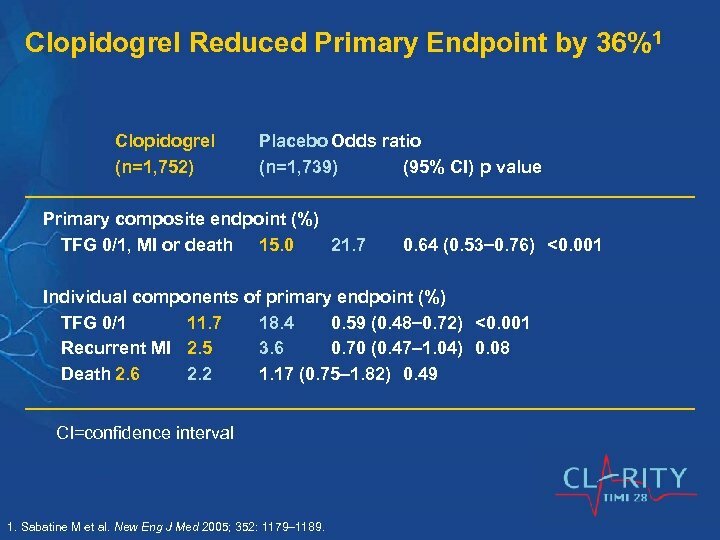 Clopidogrel Reduced Primary Endpoint by 36%1 Clopidogrel (n=1, 752) Placebo Odds ratio (n=1, 739) (95% CI) p value Primary composite endpoint (%) TFG 0/1, MI or death 15. 0 21. 7 0. 64 (0. 53 0. 76) <0. 001 Individual components of primary endpoint (%) TFG 0/1 11. 7 18. 4 0. 59 (0. 48 0. 72) <0. 001 Recurrent MI 2. 5 3. 6 0. 70 (0. 47 1. 04) 0. 08 Death 2. 6 2. 2 1. 17 (0. 75 1. 82) 0. 49 CI=confidence interval 1. Sabatine M et al. New Eng J Med 2005; 352: 1179– 1189. 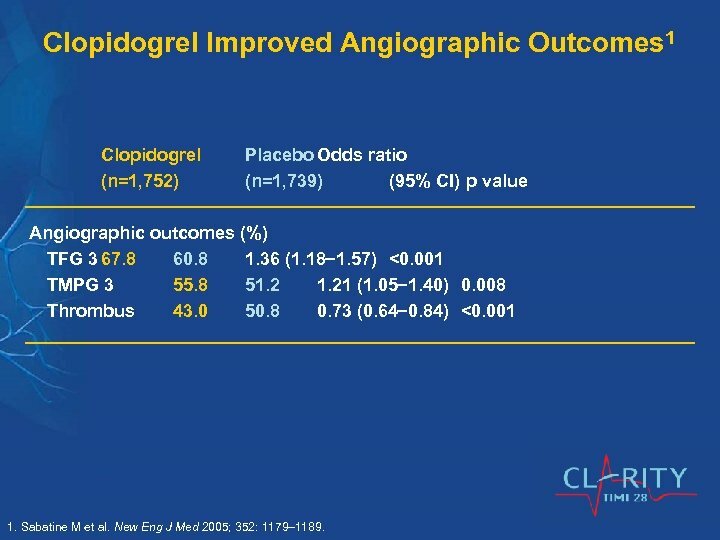 Clopidogrel Improved Angiographic Outcomes 1 Clopidogrel (n=1, 752) Placebo Odds ratio (n=1, 739) (95% CI) p value Angiographic outcomes (%) TFG 3 67. 8 60. 8 1. 36 (1. 18 1. 57) <0. 001 TMPG 3 55. 8 51. 21 (1. 05 1. 40) 0. 008 Thrombus 43. 0 50. 8 0. 73 (0. 64 0. 84) <0. 001 1. Sabatine M et al. New Eng J Med 2005; 352: 1179– 1189. 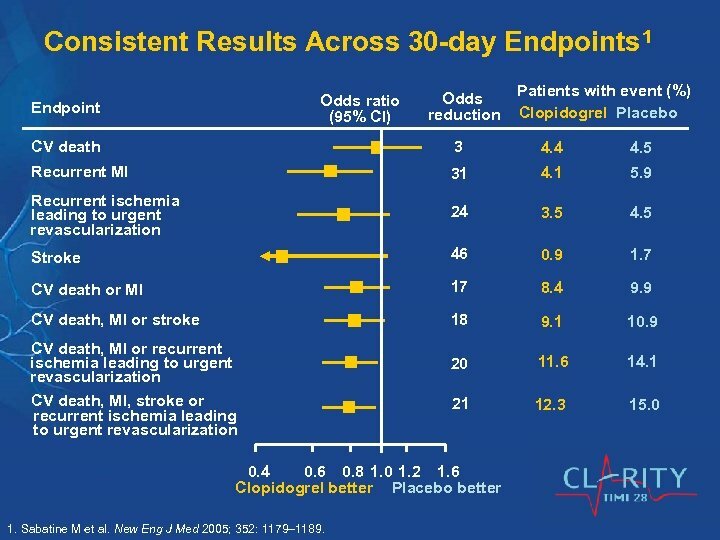 Consistent Results Across 30 -day Endpoints 1 Odds ratio (95% CI) Endpoint Odds reduction Patients with event (%) Clopidogrel Placebo CV death 3 4. 4 4. 5 Recurrent MI 31 4. 1 5. 9 Recurrent ischemia leading to urgent revascularization 24 3. 5 4. 5 Stroke 46 0. 9 1. 7 CV death or MI 17 8. 4 9. 9 CV death, MI or stroke 18 9. 1 10. 9 20 11. 6 14. 1 21 12. 3 15. 0 CV death, MI or recurrent ischemia leading to urgent revascularization CV death, MI, stroke or recurrent ischemia leading to urgent revascularization 0. 4 0. 6 0. 8 1. 0 1. 2 1. 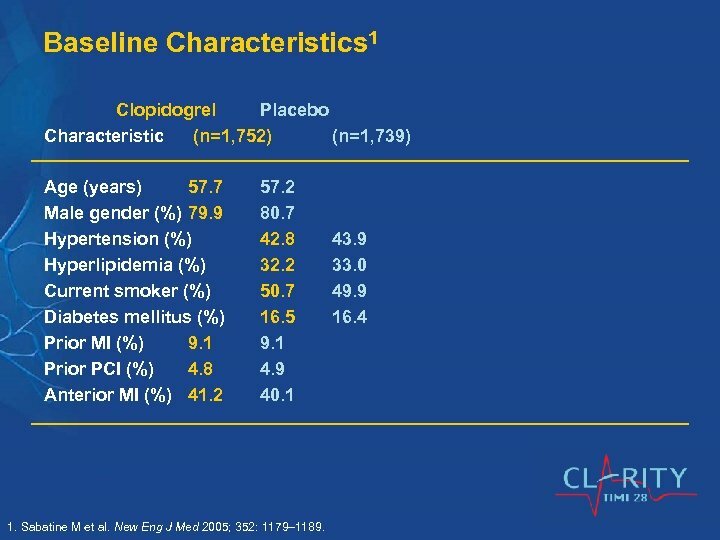 6 Clopidogrel better Placebo better 1. Sabatine M et al. New Eng J Med 2005; 352: 1179– 1189. 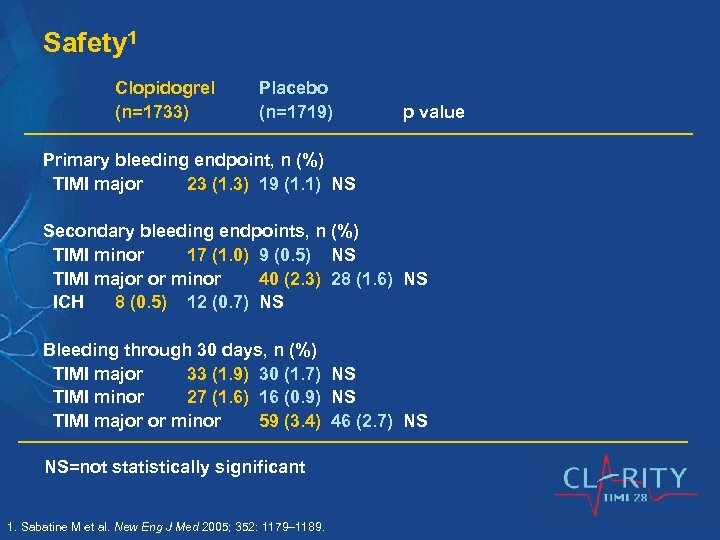 Safety 1 Clopidogrel (n=1733) Placebo (n=1719) p value Primary bleeding endpoint, n (%) TIMI major 23 (1. 3) 19 (1. 1) NS Secondary bleeding endpoints, n (%) TIMI minor 17 (1. 0) 9 (0. 5) NS TIMI major or minor 40 (2. 3) 28 (1. 6) NS ICH 8 (0. 5) 12 (0. 7) NS Bleeding through 30 days, n (%) TIMI major 33 (1. 9) 30 (1. 7) NS TIMI minor 27 (1. 6) 16 (0. 9) NS TIMI major or minor 59 (3. 4) 46 (2. 7) NS NS=not statistically significant 1. Sabatine M et al. New Eng J Med 2005; 352: 1179– 1189. 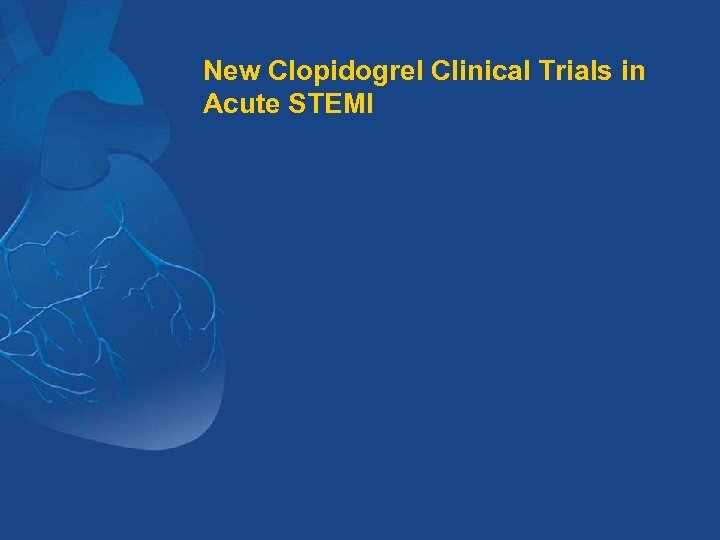 Summary 1 § In patients aged 75 years with STEMI, receiving ASA and standard fibrinolytic therapy, a loading dose of 300 mg of clopidogrel followed by clopidogrel 75 mg once daily resulted in: A 36% reduction (p <0. 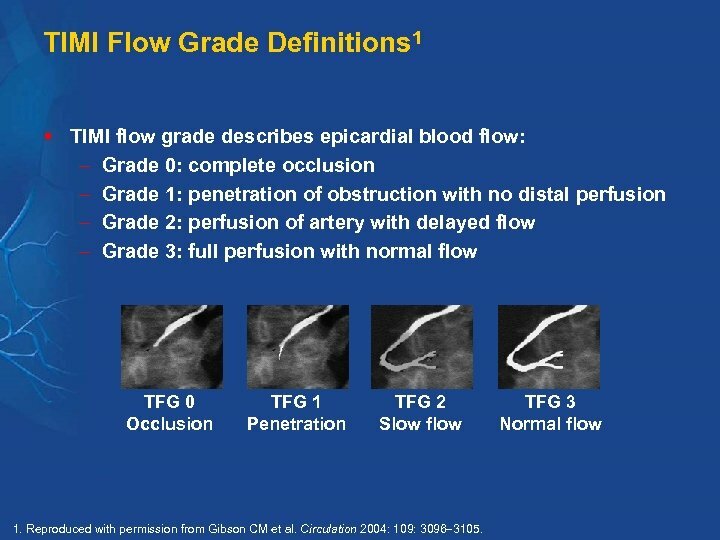 001) in the odds of an occluded infarctrelated artery, or death or MI by time of pre-discharge angiography or hospital discharge (maximum 8 days) Consistent results across all major subgroups At 30 days, a 20% reduction (p=0. 03) in CV death, MI or recurrent ischemia leading to urgent revascularization No significant excess in TIMI major bleeding or ICH 1. Sabatine M et al. New Eng J Med 2005; 352: 1179– 1189. COMMIT/CCS-2: Cl. 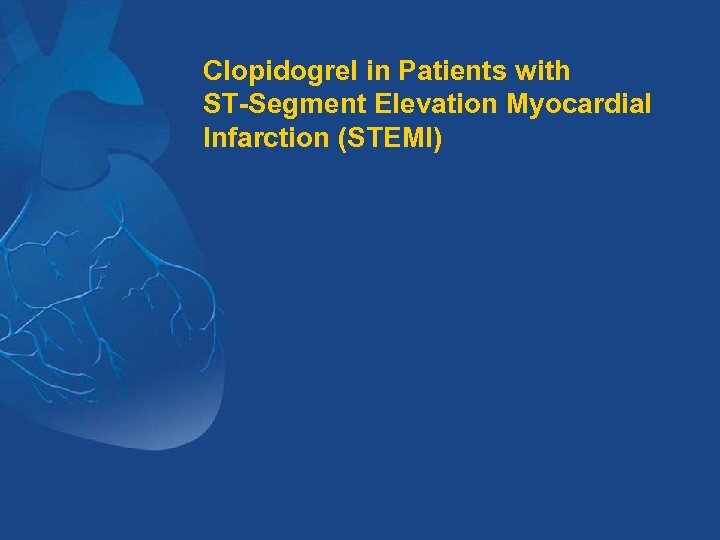 Opidogrel and Metoprolol in Myocardial Infarction Trial Purpose: To determine whether adding clopidogrel can produce a further reduction in mortality and the risk of vascular events in hospitalized patients admitted with acute STEMI 1 1. CCS-2 Collaborative Group. J Cardiovasc Risk 2000; 7: 435 441. 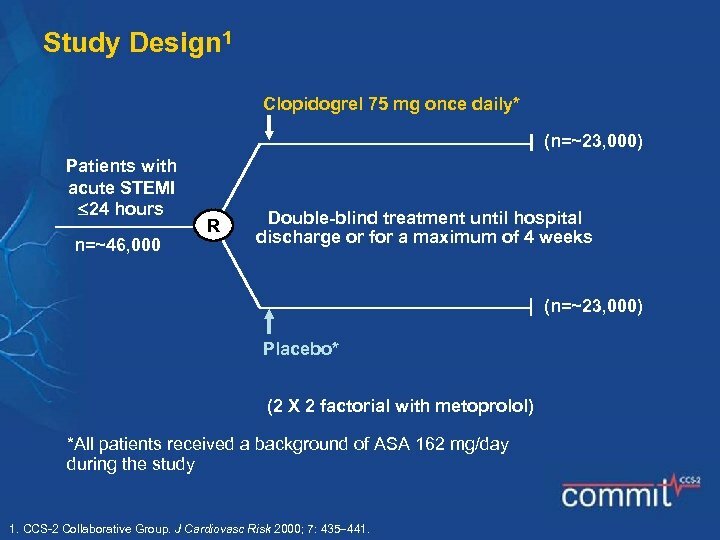 Study Design 1 Clopidogrel 75 mg once daily* (n=~23, 000) Patients with acute STEMI 24 hours n=~46, 000 R Double-blind treatment until hospital discharge or for a maximum of 4 weeks (n=~23, 000) Placebo* (2 X 2 factorial with metoprolol) *All patients received a background of ASA 162 mg/day during the study 1. CCS-2 Collaborative Group. J Cardiovasc Risk 2000; 7: 435 441. 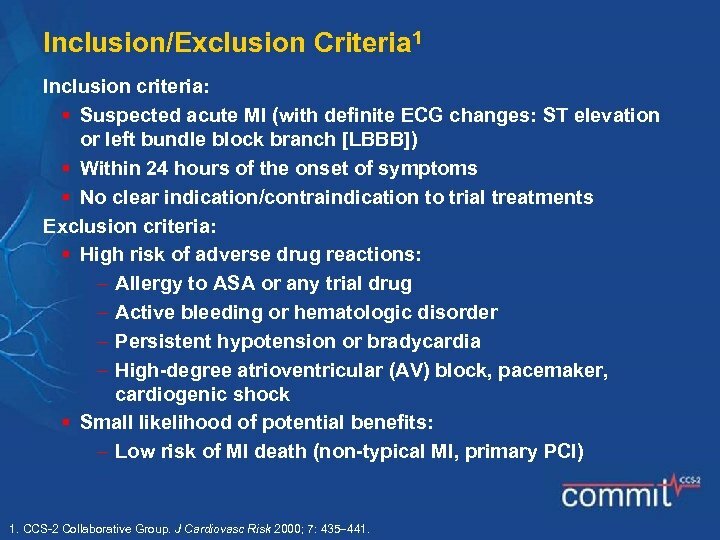 Inclusion/Exclusion Criteria 1 Inclusion criteria: § Suspected acute MI (with definite ECG changes: ST elevation or left bundle block branch [LBBB]) § Within 24 hours of the onset of symptoms § No clear indication/contraindication to trial treatments Exclusion criteria: § High risk of adverse drug reactions: Allergy to ASA or any trial drug Active bleeding or hematologic disorder Persistent hypotension or bradycardia High-degree atrioventricular (AV) block, pacemaker, cardiogenic shock § Small likelihood of potential benefits: Low risk of MI death (non-typical MI, primary PCI) 1. CCS-2 Collaborative Group. J Cardiovasc Risk 2000; 7: 435 441. 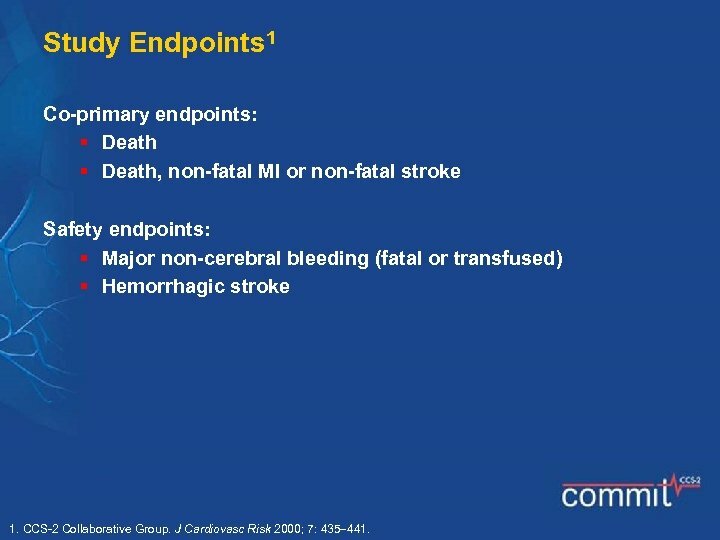 Study Endpoints 1 Co-primary endpoints: § Death, non-fatal MI or non-fatal stroke Safety endpoints: § Major non-cerebral bleeding (fatal or transfused) § Hemorrhagic stroke 1. CCS-2 Collaborative Group. J Cardiovasc Risk 2000; 7: 435 441. 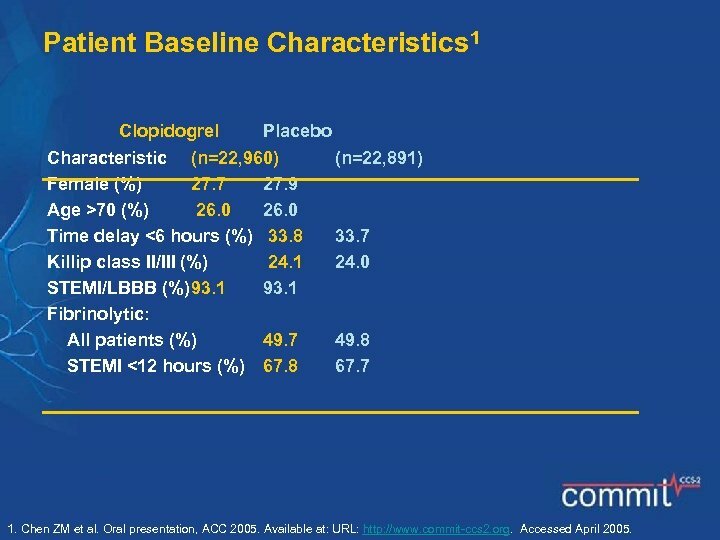 Patient Baseline Characteristics 1 Clopidogrel Placebo Characteristic (n=22, 960) Female (%) 27. 7 27. 9 Age >70 (%) 26. 0 Time delay <6 hours (%) 33. 8 Killip class II/III (%) 24. 1 STEMI/LBBB (%)93. 1 Fibrinolytic: All patients (%) 49. 7 STEMI <12 hours (%) 67. 8 (n=22, 891) 33. 7 24. 0 49. 8 67. 7 1. Chen ZM et al. Oral presentation, ACC 2005. Available at: URL: http: //www. commit-ccs 2. org. Accessed April 2005. 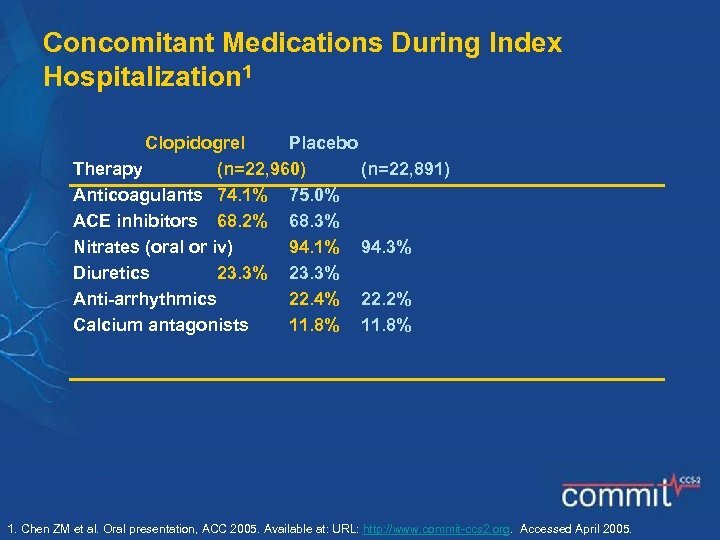 Concomitant Medications During Index Hospitalization 1 Clopidogrel Placebo Therapy (n=22, 960) (n=22, 891) Anticoagulants 74. 1% 75. 0% ACE inhibitors 68. 2% 68. 3% Nitrates (oral or iv) 94. 1% 94. 3% Diuretics 23. 3% Anti-arrhythmics 22. 4% 22. 2% Calcium antagonists 11. 8% 1. Chen ZM et al. Oral presentation, ACC 2005. Available at: URL: http: //www. commit-ccs 2. org. Accessed April 2005. 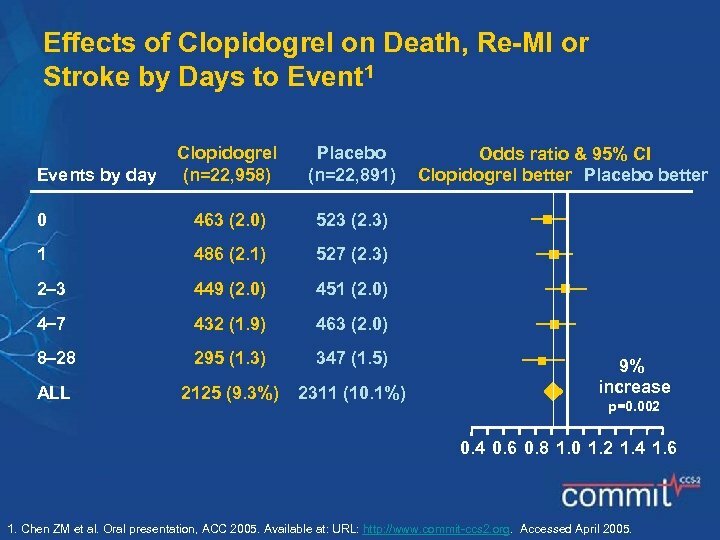 Clopidogrel Reduced the Composite of Death, MI or Stroke by 9%1 Events (%) Placebo (10. 1%) 10 9 8 7 6 5 4 3 2 1 0 RRR=9% p=0. 002 Clopidogrel (9. 3%) 0 7 14 21 28 Days (up to 28 days) RRR=relative risk reduction 1. Chen ZM et al. Oral presentation, ACC 2005. Available at: URL: http: //www. commit-ccs 2. org. Accessed April 2005. 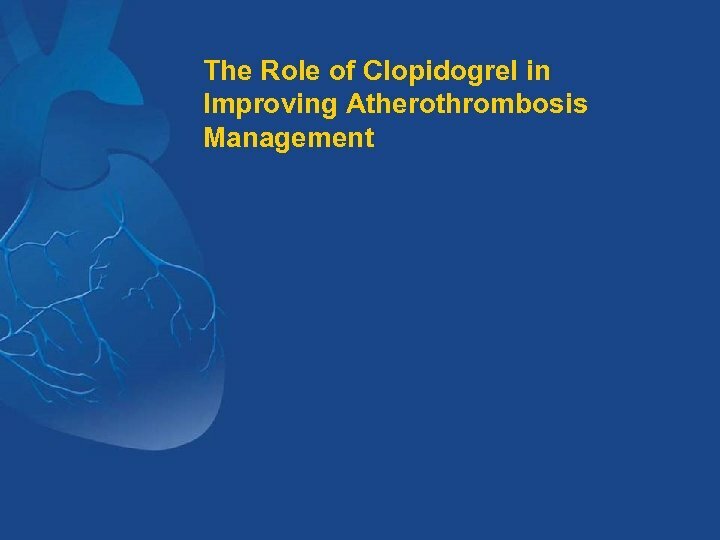 Clopidogrel Reduced Mortality by 7%1 Placebo (8. 1%) 9 8 p=0. 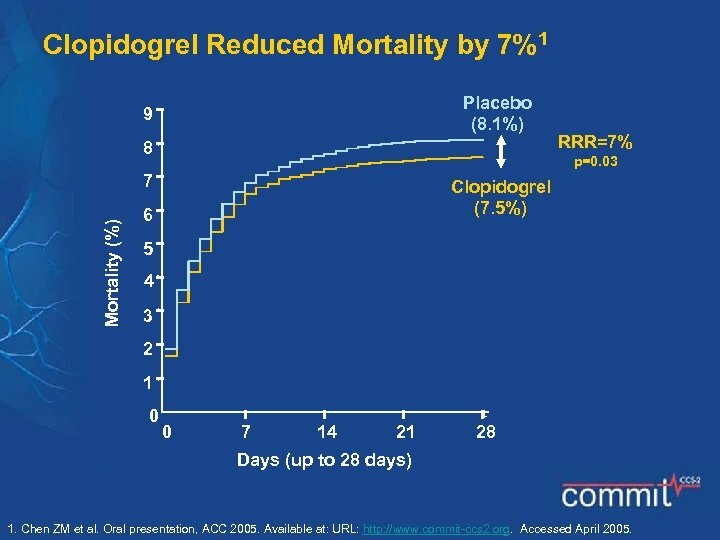 03 7 Mortality (%) RRR=7% Clopidogrel (7. 5%) 6 5 4 3 2 1 0 0 7 14 21 28 Days (up to 28 days) 1. Chen ZM et al. Oral presentation, ACC 2005. Available at: URL: http: //www. commit-ccs 2. org. Accessed April 2005. 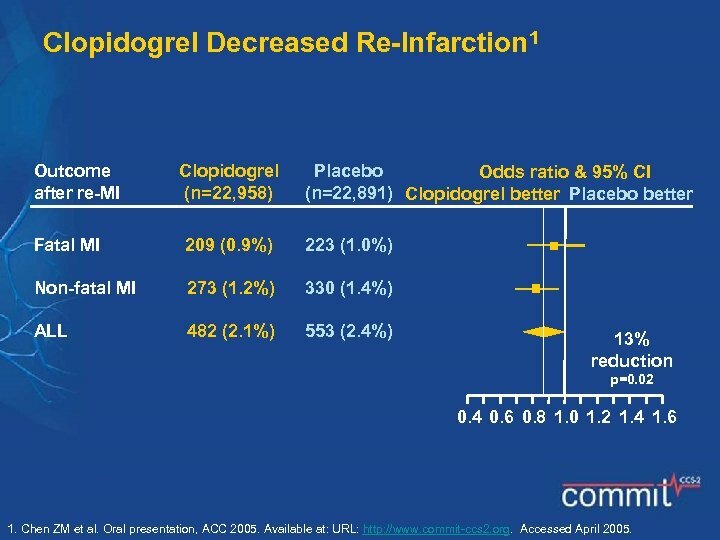 Clopidogrel Decreased Re-Infarction 1 Outcome after re-MI Clopidogrel (n=22, 958) Placebo Odds ratio & 95% CI (n=22, 891) Clopidogrel better Placebo better Fatal MI 209 (0. 9%) 223 (1. 0%) Non-fatal MI 273 (1. 2%) 330 (1. 4%) ALL 482 (2. 1%) 553 (2. 4%) 13% reduction p=0. 02 0. 4 0. 6 0. 8 1. 0 1. 2 1. 4 1. 6 1. Chen ZM et al. Oral presentation, ACC 2005. Available at: URL: http: //www. commit-ccs 2. org. Accessed April 2005. 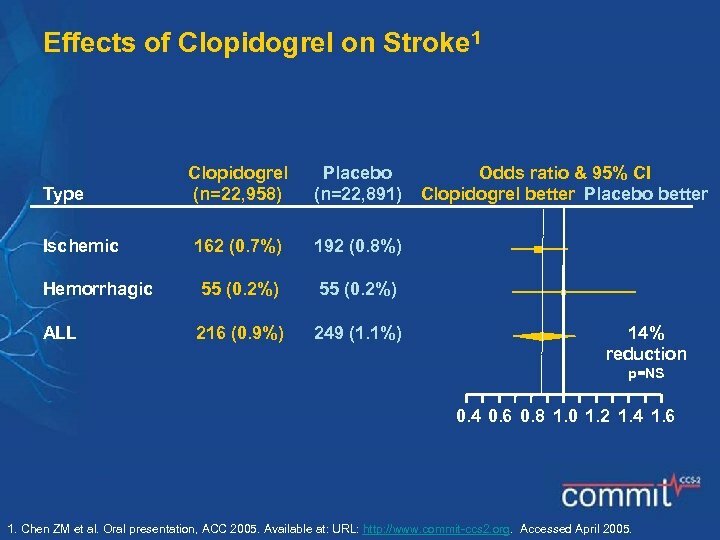 Effects of Clopidogrel on Stroke 1 Clopidogrel (n=22, 958) Placebo (n=22, 891) 162 (0. 7%) 192 (0. 8%) Hemorrhagic 55 (0. 2%) ALL 216 (0. 9%) 249 (1. 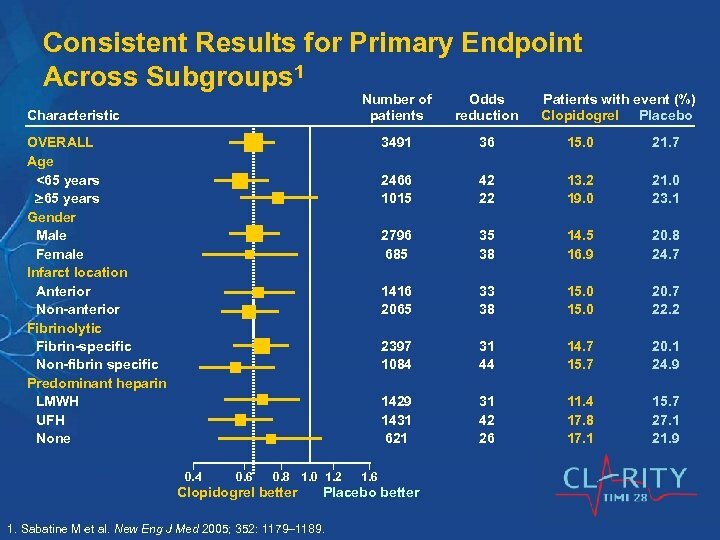 1%) Type Ischemic Odds ratio & 95% CI Clopidogrel better Placebo better 14% reduction p=NS 0. 4 0. 6 0. 8 1. 0 1. 2 1. 4 1. 6 1. Chen ZM et al. Oral presentation, ACC 2005. Available at: URL: http: //www. commit-ccs 2. org. Accessed April 2005. 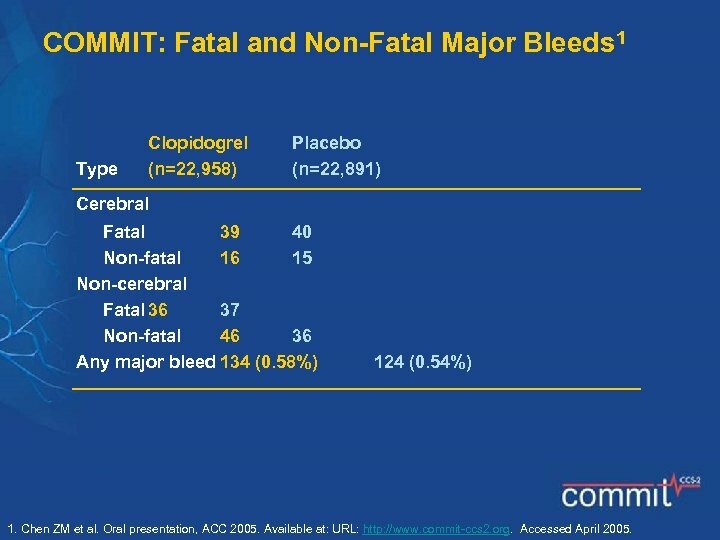 COMMIT: Fatal and Non-Fatal Major Bleeds 1 Type Clopidogrel (n=22, 958) Placebo (n=22, 891) Cerebral Fatal 39 40 Non-fatal 16 15 Non-cerebral Fatal 36 37 Non-fatal 46 36 Any major bleed 134 (0. 58%) 124 (0. 54%) 1. Chen ZM et al. Oral presentation, ACC 2005. Available at: URL: http: //www. commit-ccs 2. org. Accessed April 2005. 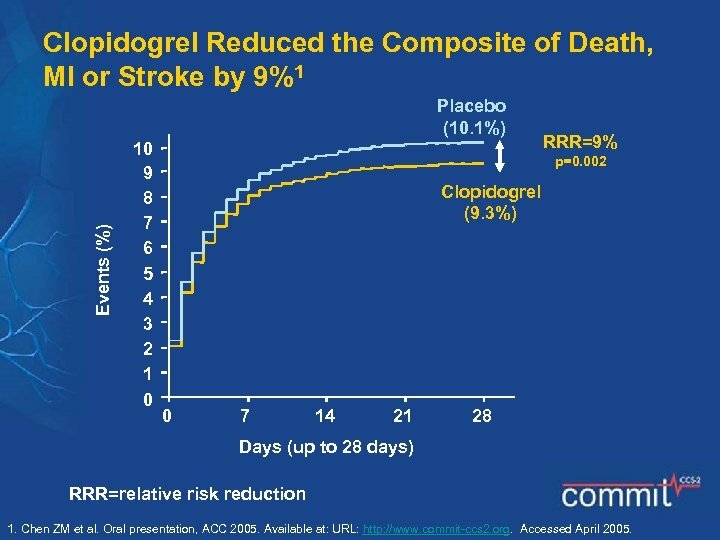 Effects of Clopidogrel on Death, Re-MI or Stroke by Days to Event 1 Clopidogrel (n=22, 958) Placebo (n=22, 891) 0 463 (2. 0) 523 (2. 3) 1 486 (2. 1) 527 (2. 3) 2 3 449 (2. 0) 451 (2. 0) 4 7 432 (1. 9) 463 (2. 0) 8 28 295 (1. 3) 347 (1. 5) ALL 2125 (9. 3%) 2311 (10. 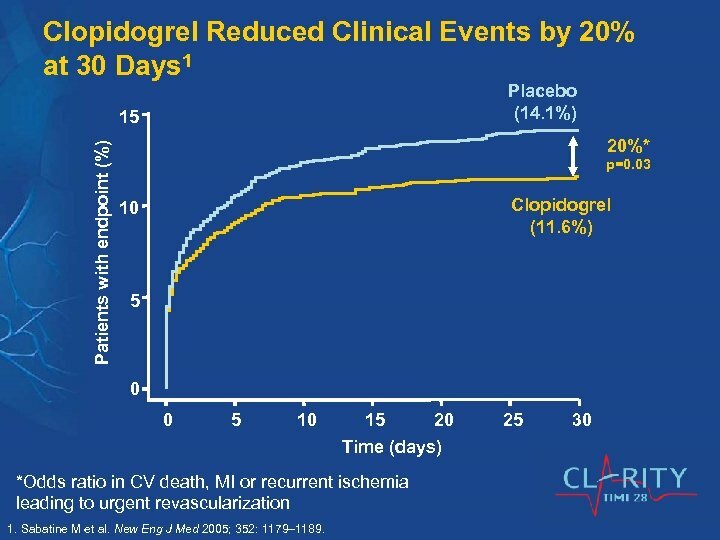 1%) Events by day Odds ratio & 95% CI Clopidogrel better Placebo better 9% increase p=0. 002 0. 4 0. 6 0. 8 1. 0 1. 2 1. 4 1. 6 1. Chen ZM et al. Oral presentation, ACC 2005. Available at: URL: http: //www. commit-ccs 2. org. Accessed April 2005. 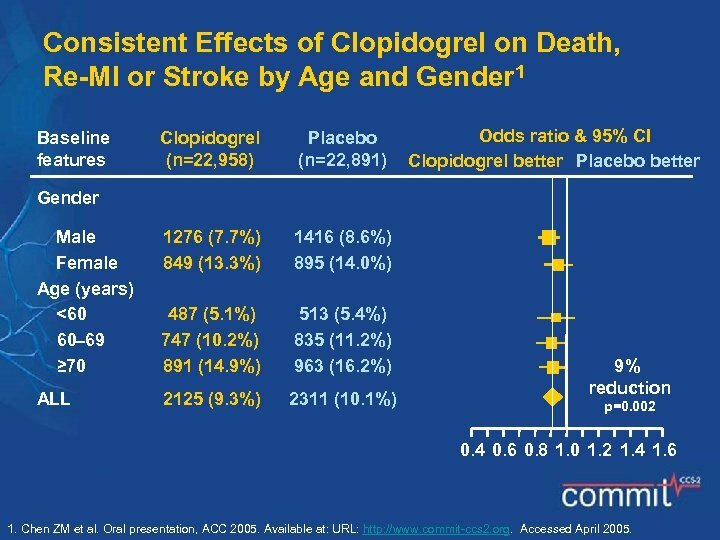 Consistent Effects of Clopidogrel on Death, Re-MI or Stroke by Age and Gender 1 Baseline features Clopidogrel (n=22, 958) Placebo (n=22, 891) Odds ratio & 95% CI Clopidogrel better Placebo better Gender Male Female Age (years) <60 60 69 ≥ 70 1276 (7. 7%) 849 (13. 3%) 1416 (8. 6%) 895 (14. 0%) 487 (5. 1%) 747 (10. 2%) 891 (14. 9%) 513 (5. 4%) 835 (11. 2%) 963 (16. 2%) ALL 2125 (9. 3%) 2311 (10. 1%) 9% reduction p=0. 002 0. 4 0. 6 0. 8 1. 0 1. 2 1. 4 1. 6 1. Chen ZM et al. Oral presentation, ACC 2005. Available at: URL: http: //www. commit-ccs 2. org. Accessed April 2005. 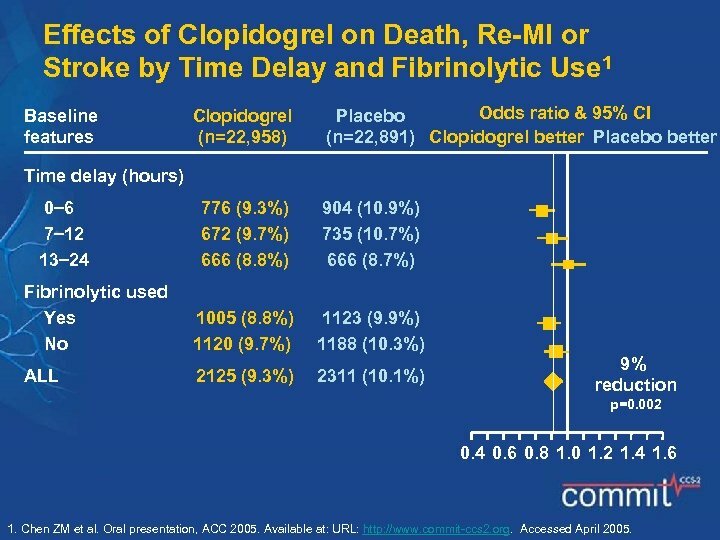 Effects of Clopidogrel on Death, Re-MI or Stroke by Time Delay and Fibrinolytic Use 1 Baseline features Clopidogrel (n=22, 958) Odds ratio & 95% CI Placebo (n=22, 891) Clopidogrel better Placebo better Time delay (hours) 0 6 7 12 13 24 776 (9. 3%) 672 (9. 7%) 666 (8. 8%) 904 (10. 9%) 735 (10. 7%) 666 (8. 7%) Fibrinolytic used Yes No 1005 (8. 8%) 1120 (9. 7%) 1123 (9. 9%) 1188 (10. 3%) ALL 2125 (9. 3%) 2311 (10. 1%) 9% reduction p=0. 002 0. 4 0. 6 0. 8 1. 0 1. 2 1. 4 1. 6 1. Chen ZM et al. Oral presentation, ACC 2005. Available at: URL: http: //www. commit-ccs 2. org. Accessed April 2005. 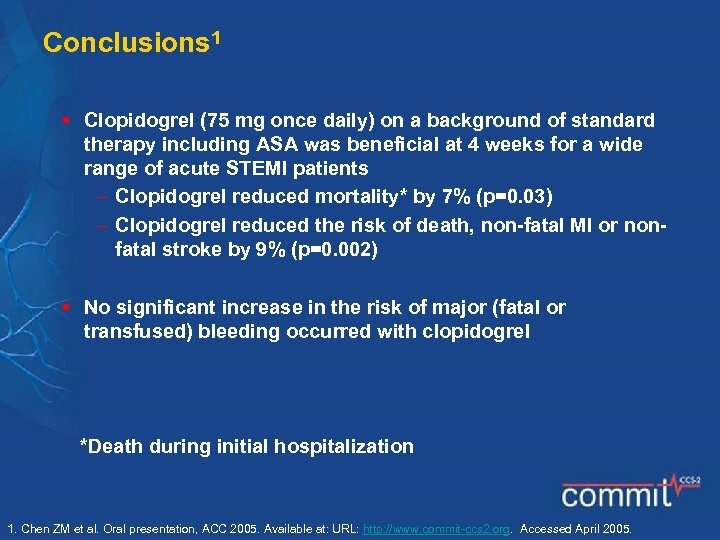 Conclusions 1 § Clopidogrel (75 mg once daily) on a background of standard therapy including ASA was beneficial at 4 weeks for a wide range of acute STEMI patients Clopidogrel reduced mortality* by 7% (p=0. 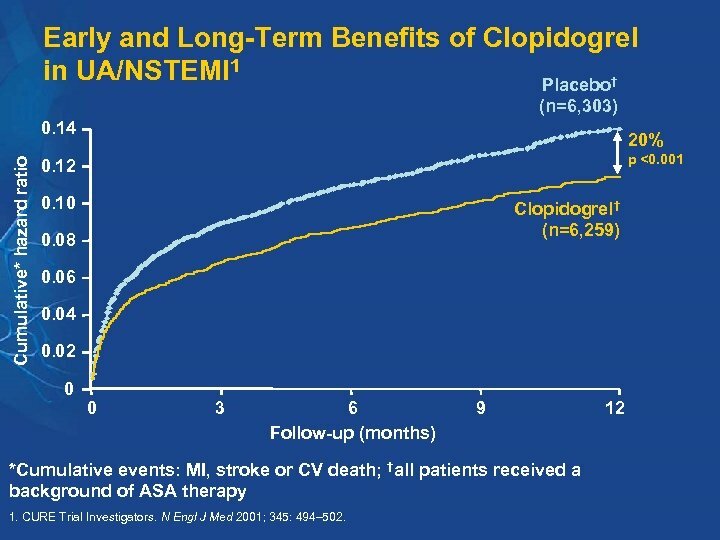 03) Clopidogrel reduced the risk of death, non-fatal MI or nonfatal stroke by 9% (p=0. 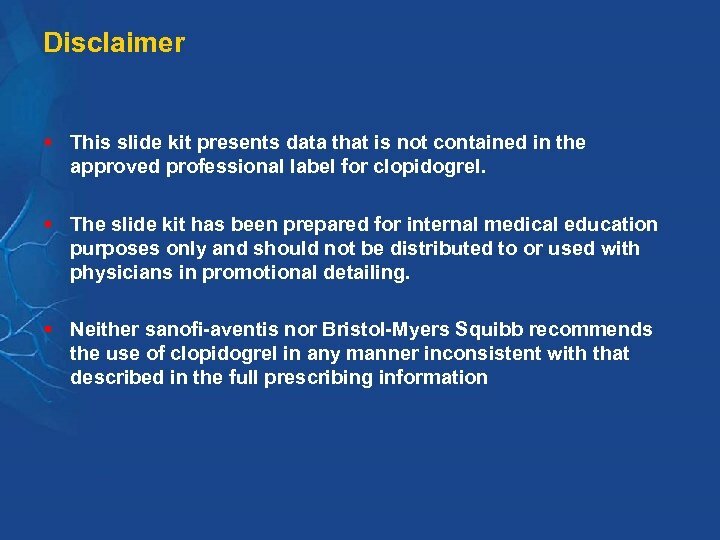 002) § No significant increase in the risk of major (fatal or transfused) bleeding occurred with clopidogrel *Death during initial hospitalization 1. Chen ZM et al. Oral presentation, ACC 2005. Available at: URL: http: //www. commit-ccs 2. org. Accessed April 2005. 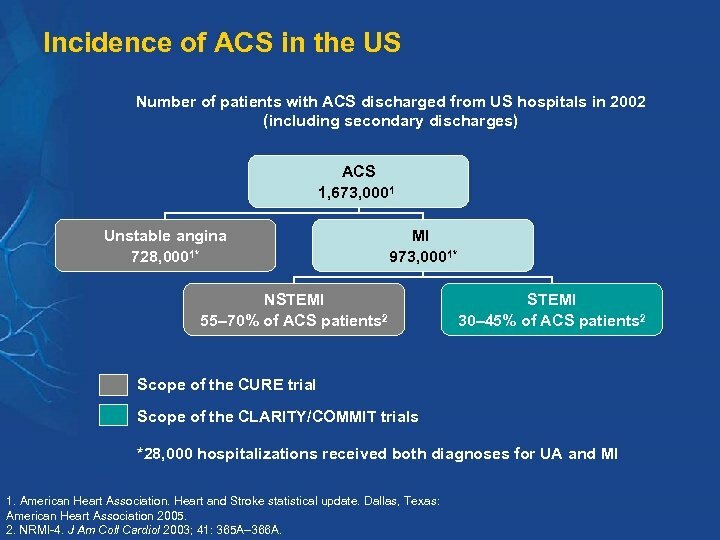 Incidence of ACS in the US Number of patients with ACS discharged from US hospitals in 2002 (including secondary discharges) ACS 1, 673, 0001 Unstable angina 728, 0001* MI 973, 0001* NSTEMI 55– 70% of ACS patients 2 STEMI 30– 45% of ACS patients 2 Scope of the CURE trial Scope of the CLARITY/COMMIT trials *28, 000 hospitalizations received both diagnoses for UA and MI 1. American Heart Association. Heart and Stroke statistical update. Dallas, Texas: American Heart Association 2005. 2. NRMI-4. J Am Coll Cardiol 2003; 41: 365 A– 366 A. 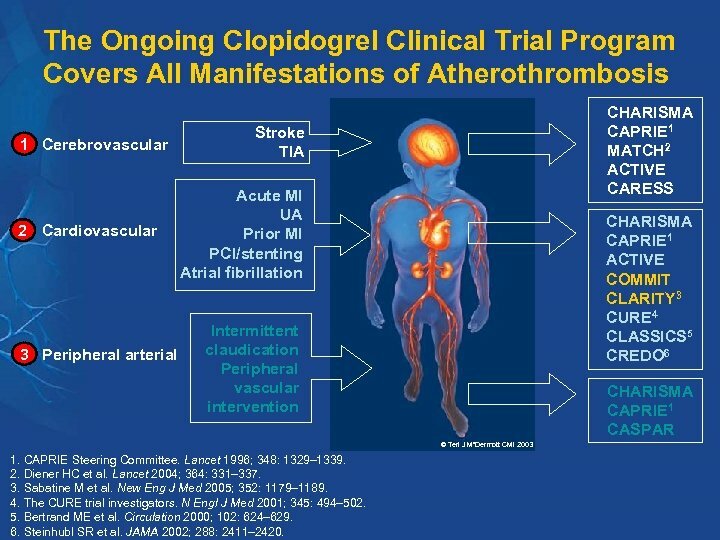 The Ongoing Clopidogrel Clinical Trial Program Covers All Manifestations of Atherothrombosis 1 Cerebrovascular 2 Cardiovascular 3 Peripheral arterial CHARISMA CAPRIE 1 MATCH 2 ACTIVE CARESS Stroke TIA Acute MI UA Prior MI PCI/stenting Atrial fibrillation CHARISMA CAPRIE 1 ACTIVE COMMIT CLARITY 3 CURE 4 CLASSICS 5 CREDO 6 Intermittent claudication Peripheral vascular intervention CHARISMA CAPRIE 1 CASPAR © Teri J Mc. Dermott CMI 2003 1. CAPRIE Steering Committee. Lancet 1996; 348: 1329– 1339. 2. Diener HC et al. Lancet 2004; 364: 331– 337. 3. Sabatine M et al. New Eng J Med 2005; 352: 1179– 1189. 4. The CURE trial investigators. N Engl J Med 2001; 345: 494– 502. 5. Bertrand ME et al. Circulation 2000; 102: 624– 629. 6. Steinhubl SR et al. JAMA 2002; 288: 2411– 2420.